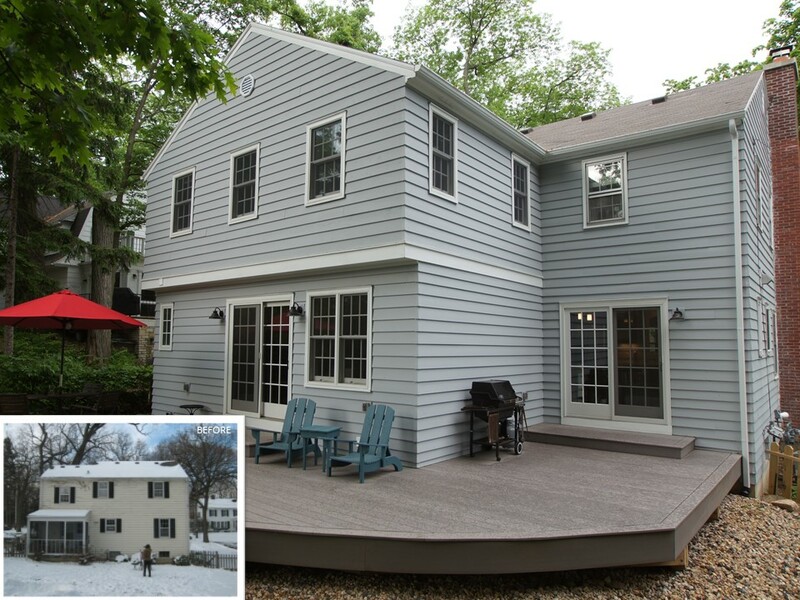 With our latest deck project in Madison, WI under construction, we’d like to put some information on our blog regarding our favorite decking system. 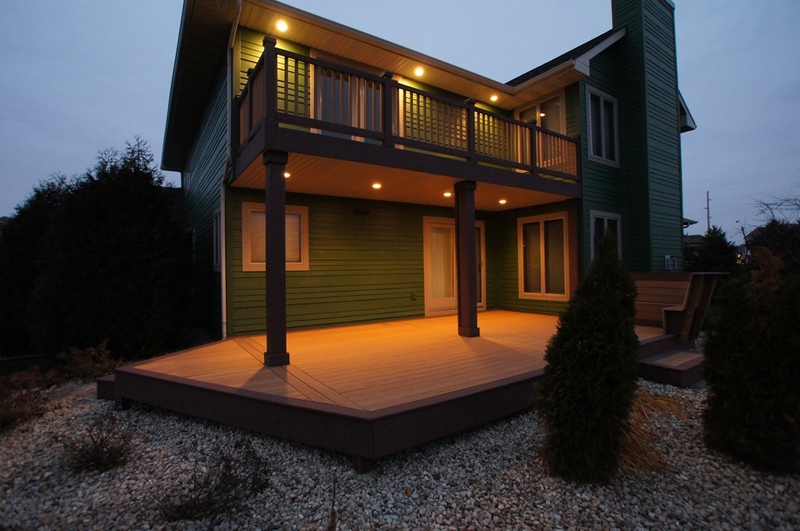 Over the past 3 years, we have built three decks out of MoistureShield Decking. 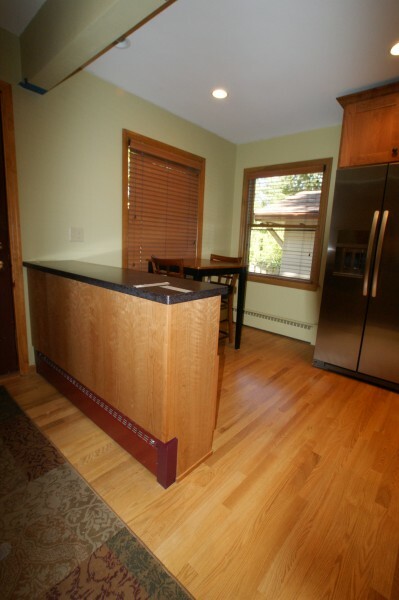 Two of the three decks have been a two-tone design, with the border and skirt board in a contrasting color. 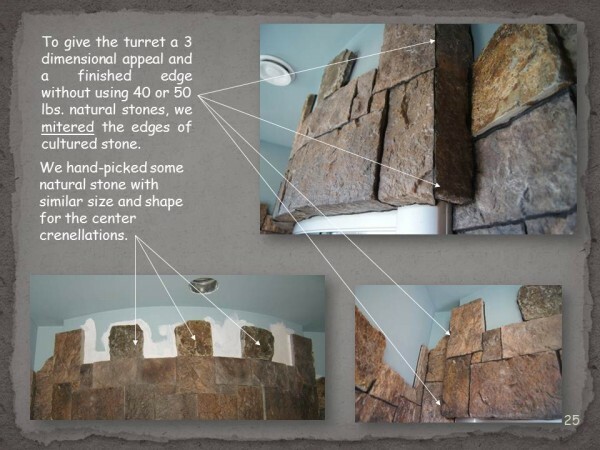 MoistureShield is available is a variety of colors, creating a unique outdoor living space. 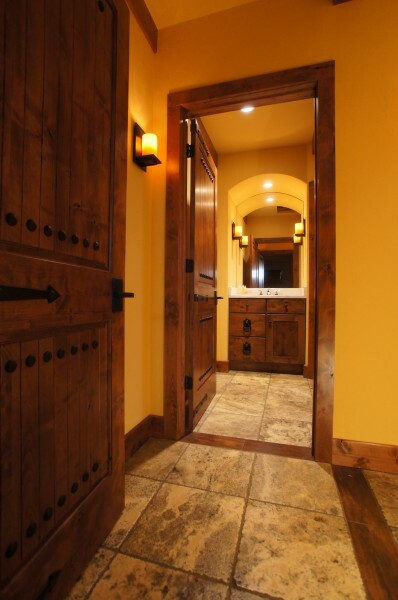 Our clients are ecstatic with the finished look, from the colors to the perfectly mitered corners. 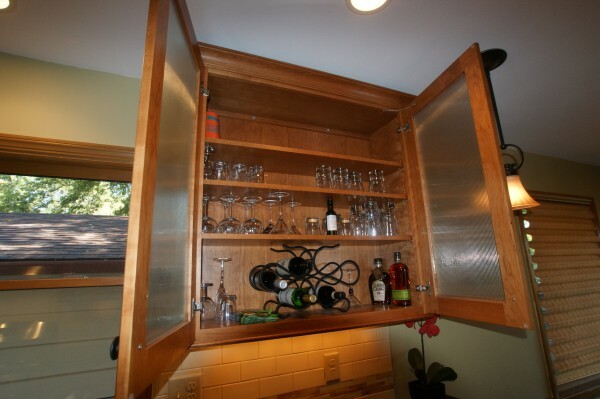 The concealed clips allow for a seamless finish, with no screw holes on the finished surface. 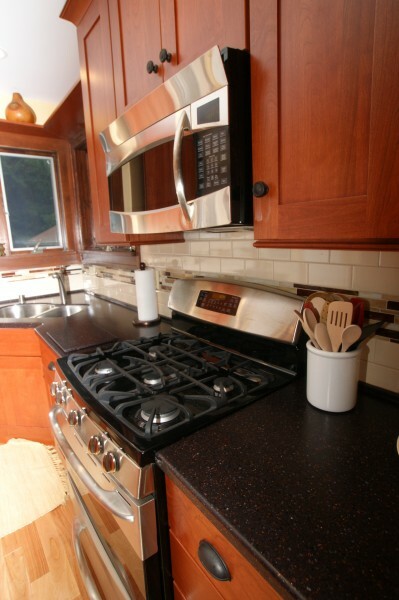 This makes for a beautiful, yet durable finished product that’s also easy to clean. 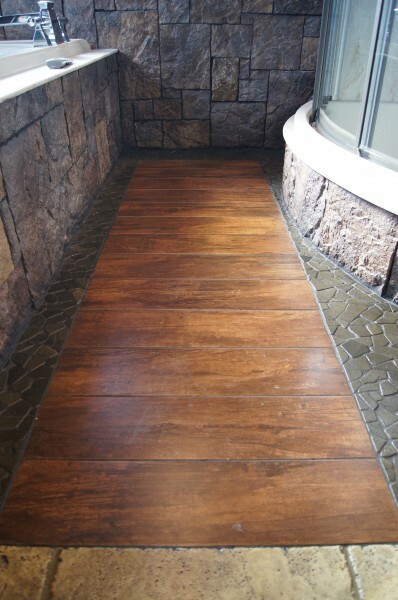 MoistureSheild decking is also stain, fade, scratch, mold and mildew resistant. 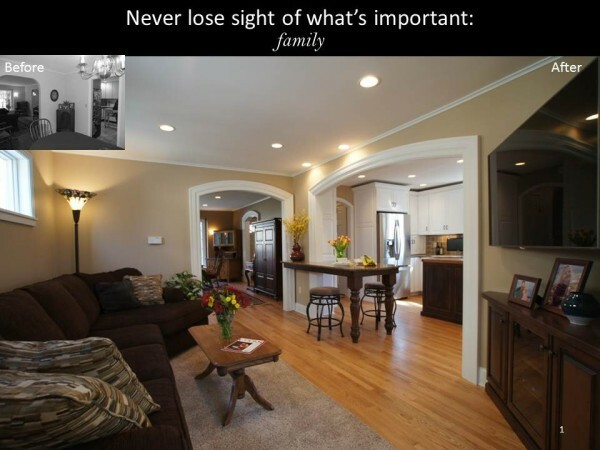 It’s designed to last a lifetime. 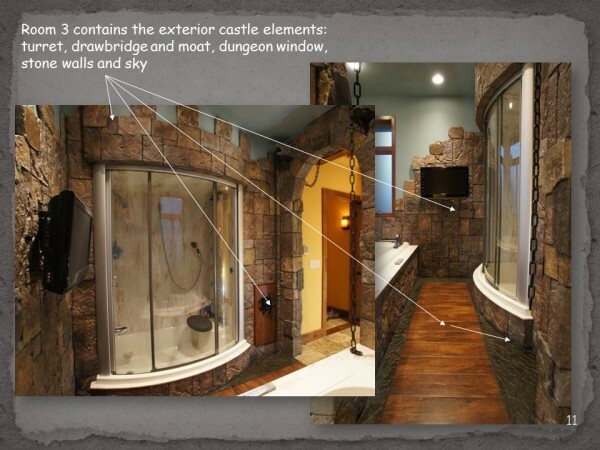 In addition to high performance and aesthetics, MoistureShield is also in line with the pricing of Trex deck systems. 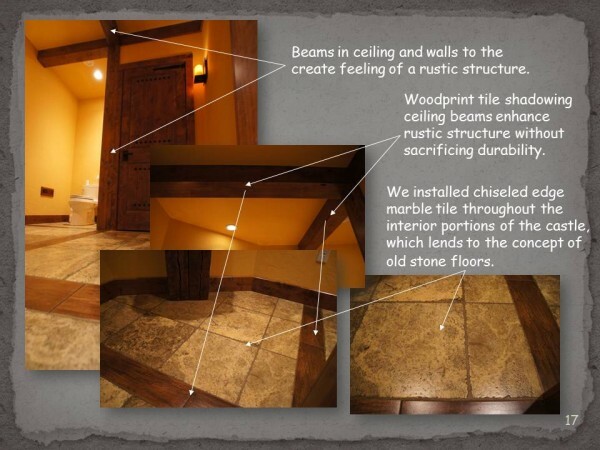 Our carpenters prefer the install on MoistureShield over Trex due to MoistureShield looking and feeling like wood (not plastic like feel/aesthetic like Trex). 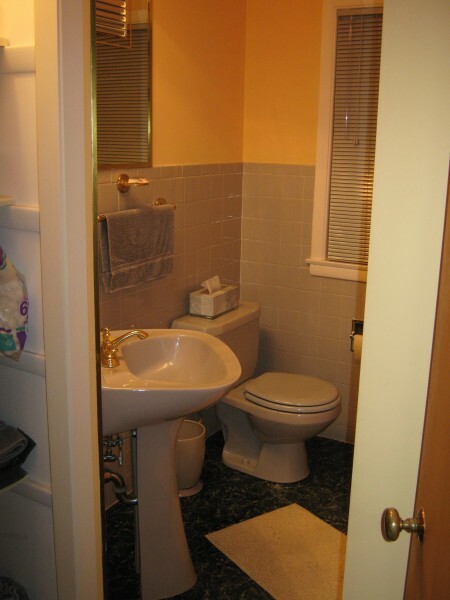 Furthermore, it has a marine rating, which lends itself to a longer lifetime. 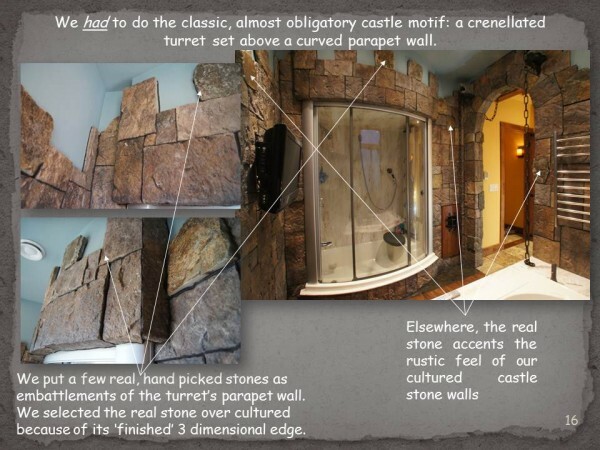 Most MoistureShield products have a limited lifetime warranty. 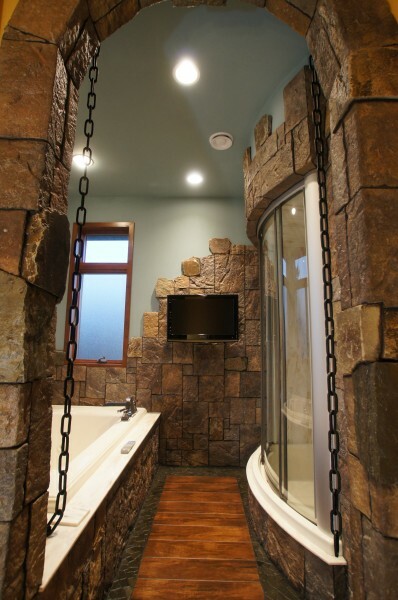 MoistureShield is also a very environmentally conscious company, with a highly sustainable manufacturing process. 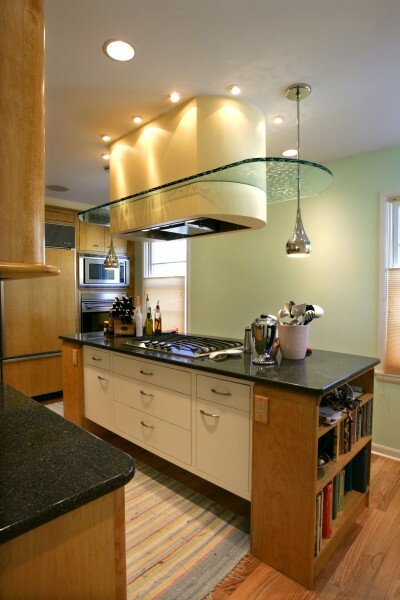 Their parent company, Advanced Environmental Recycling Technologies, Inc. is a leading plastics recycler and manufacturer of green composite building products. 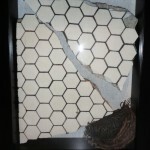 MoistureShield has a total of 95% total recycled content (38% post consumer, 57% pre-consumer). 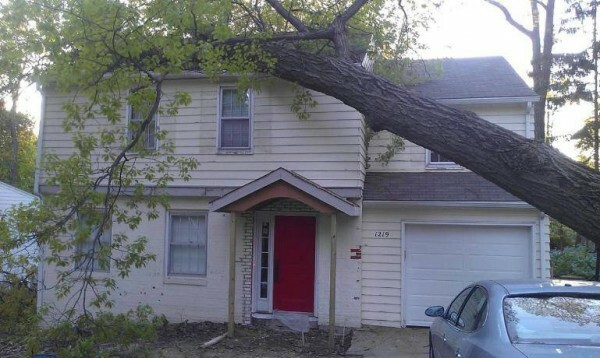 MoistureShield doesn’t cut down new trees to make its decking. 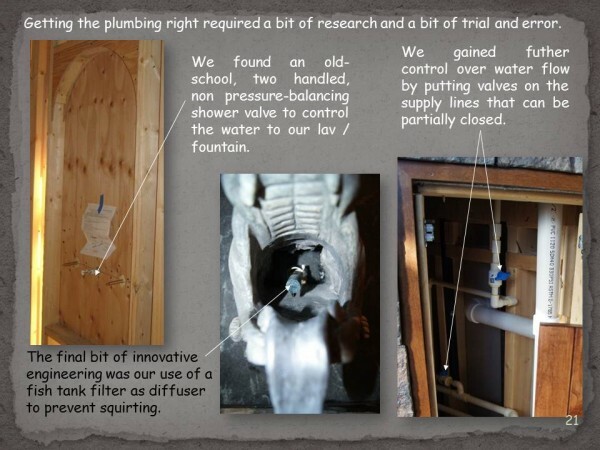 All things accounted for, we feel confident we’ve been supplying and installing the best of the best for our clients. 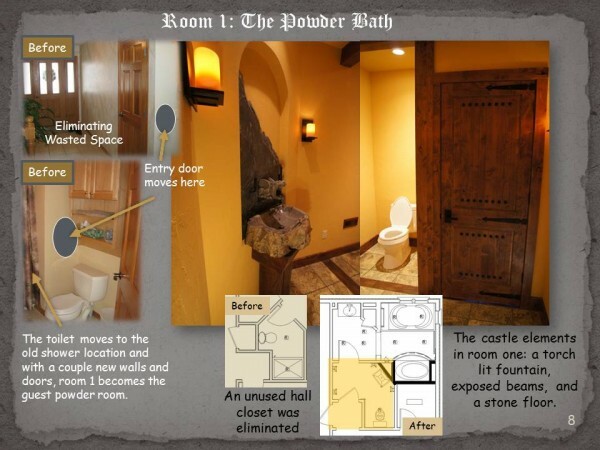 Because of this, they’ve been loving the results. 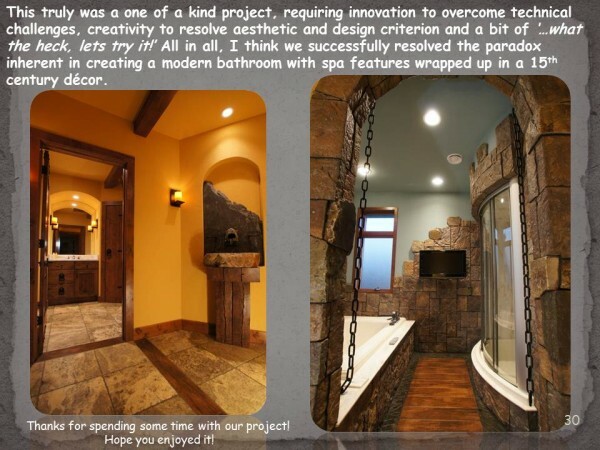 To see more project photos, visit our Sun Rooms & Decks page. 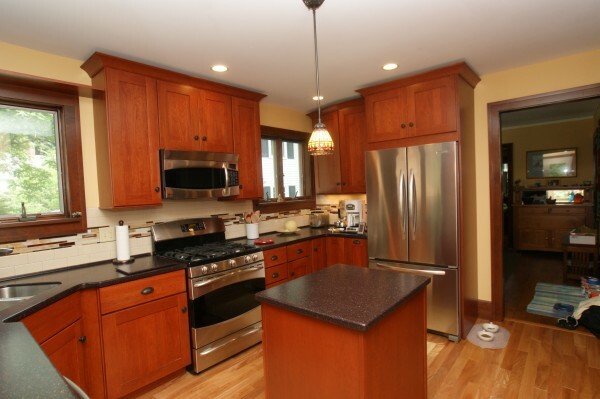 This old colonial home in Madison, WI lacked kitchen storage, efficiency, and yes, even a dishwasher! 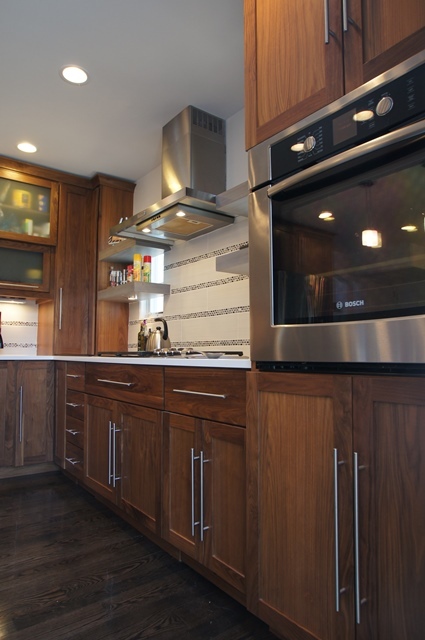 This kitchen renovation gave this couple everything they needed and much more! 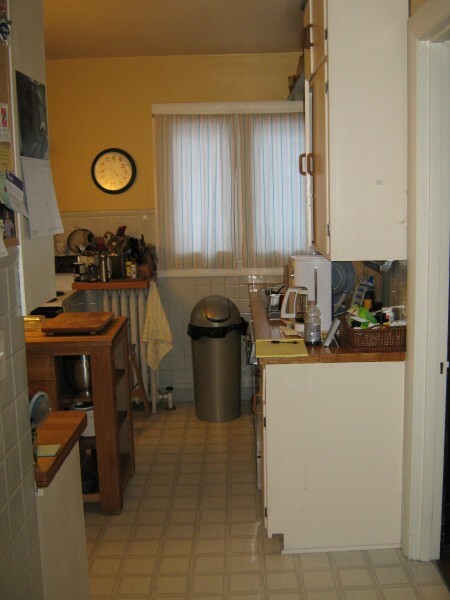 With the basement door entering into the kitchen space, there wasn’t much room for improvement. 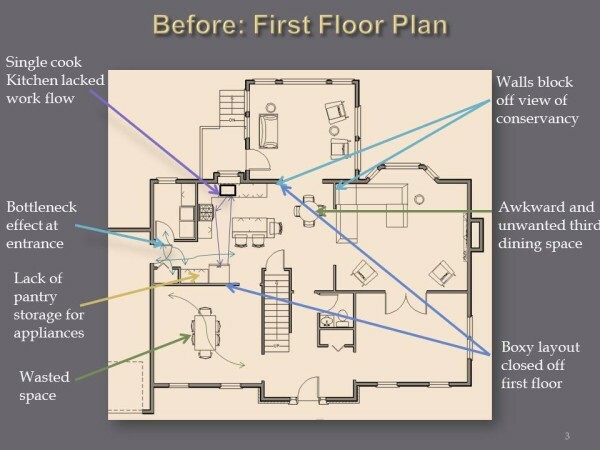 The adjacent dining room’s entry into the living room broke the living room up. 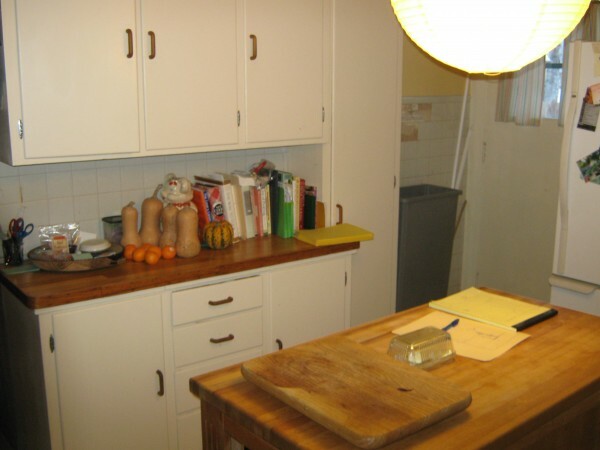 As a result, carrying groceries from the front entry to the kitchen was difficult. 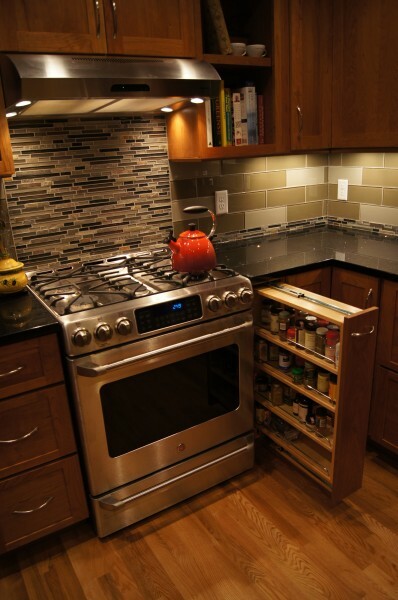 This kitchen renovation took some creative thinking. 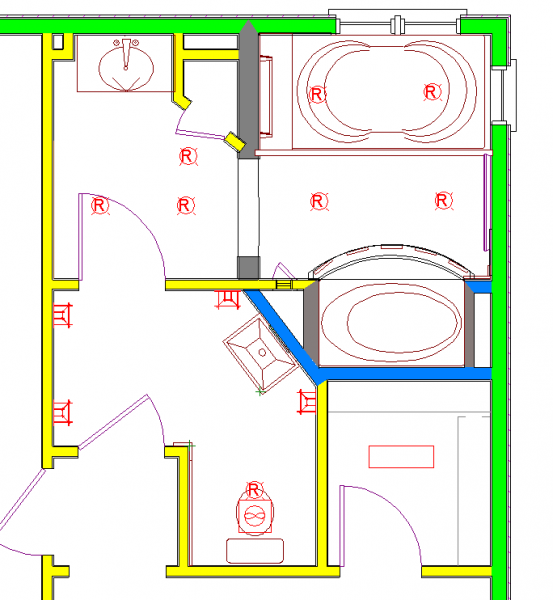 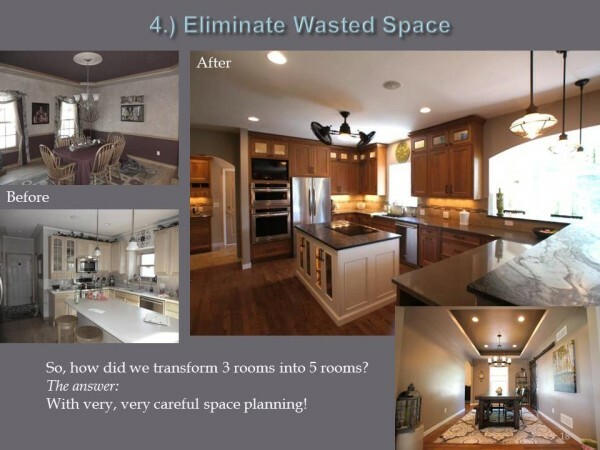 After providing several ideas, the homeowners selected the option of swapping spaces! 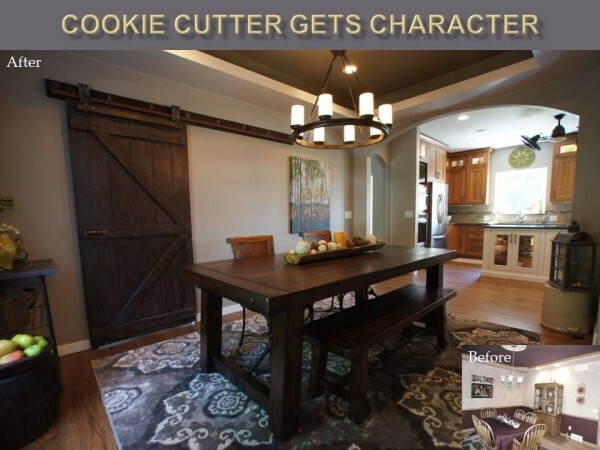 We completely swapped their dining room space with their kitchen space and relocated the entry into the living room. 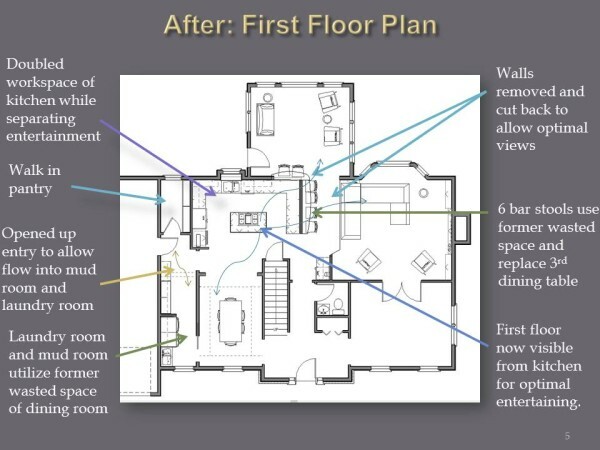 By moving the living room entry, the space went from awkward and broken up to unified and comfortable. 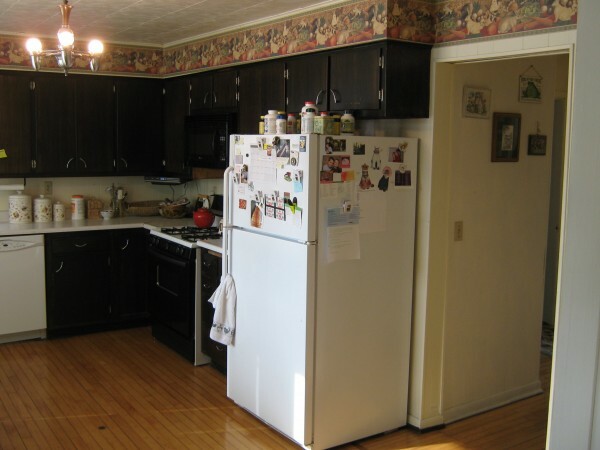 The entry from the front door into the kitchen became a direct route, which helped greatly with groceries. 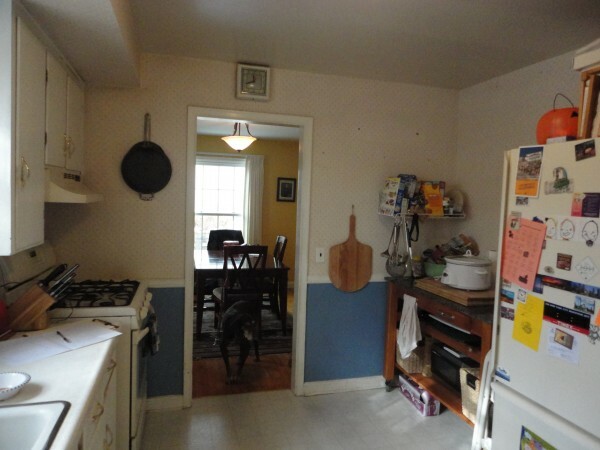 Along with swapping spaces, we also swapped windows and doors. 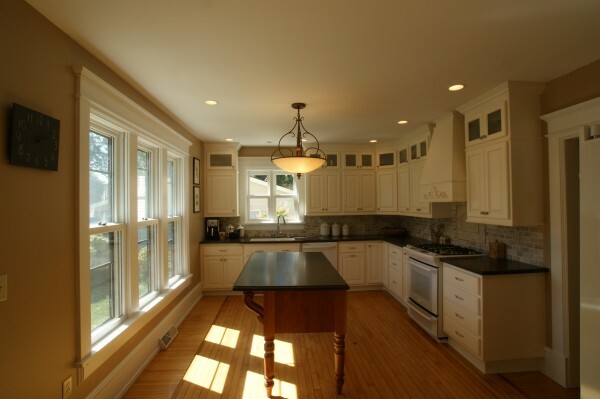 We reused the large window from the old dining room in the new dining room space. 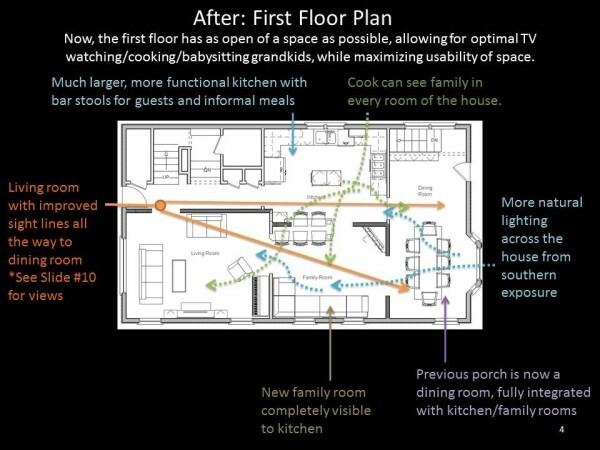 We also moved the patio door down into the dining room so that the spacing around the dining table could be used as walkway. 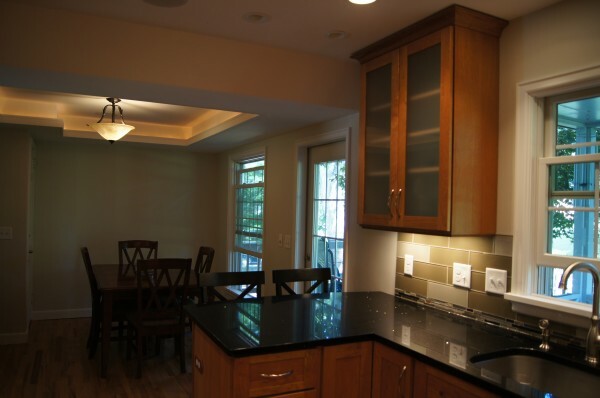 The dining room now feels open and spacious, while the kitchen was transformed into a U-shape with a peninsula and pantry. 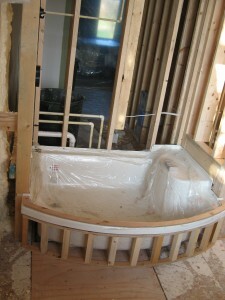 One obstacle we had to overcome was the soffit that had to stay in the ceiling where the plumbing above ran across. 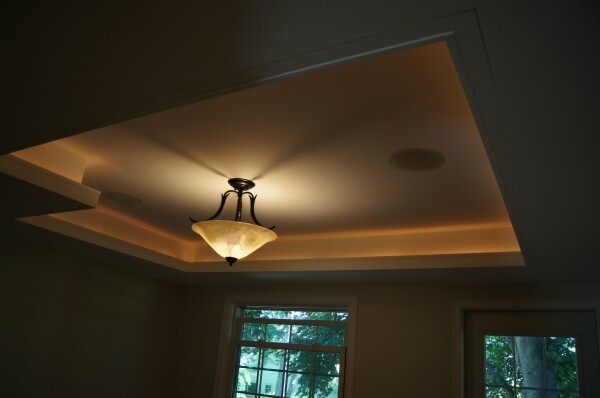 Instead of just covering the soffit with drywall and calling it a day, we thought it would be much more visually interesting to put in cove lighting. 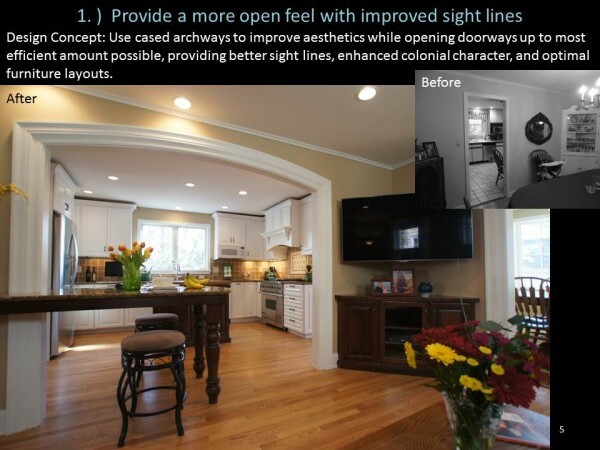 By simply putting in a nearly rectangular soffit around the dining area, and putting up a piece of wood trim to hide the lighting, we transformed something awkward into something very attractive – now adding some drama to their beautiful old house. 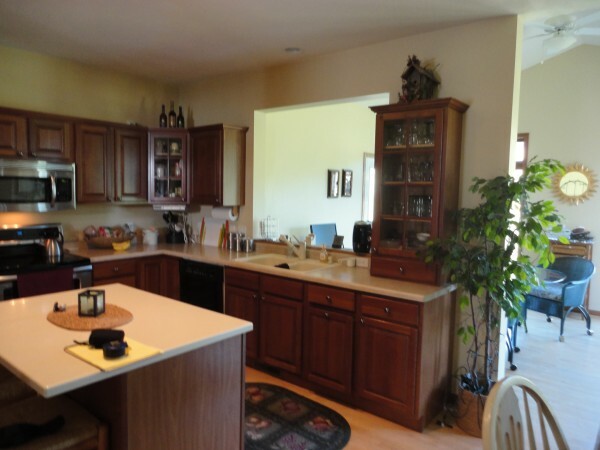 The kitchen provides all the appliances the home owners wanted – yes, they finally have that dishwasher! 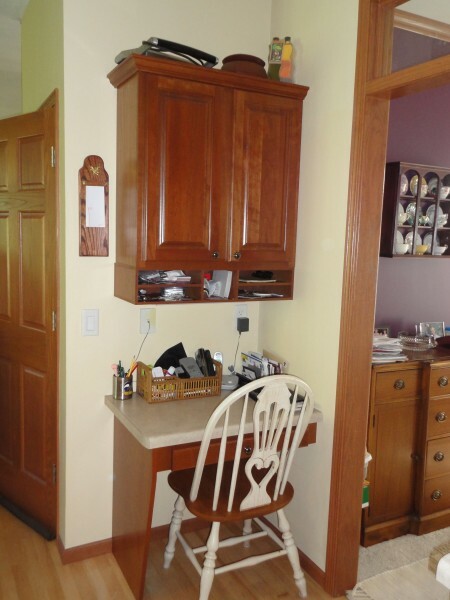 Instead of angled corner cabinets, the couple chose some 90 degree corner cabinets with piano hinges that allow them to easily access all if its contents. 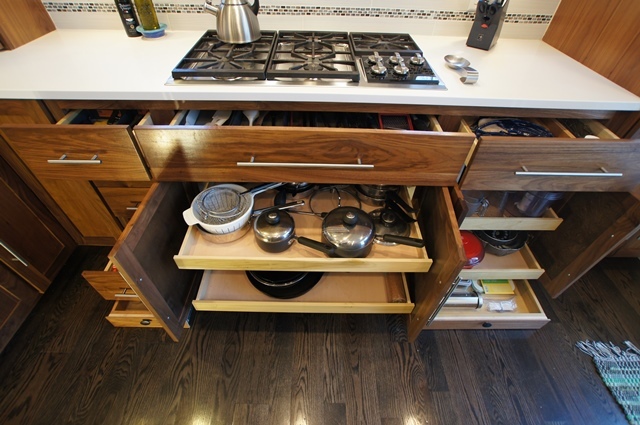 Large drawers store their pots and pans, and they enjoy several other storage features – tilt out trays, wine rack, pull out spice rack, and wire tray dividers. 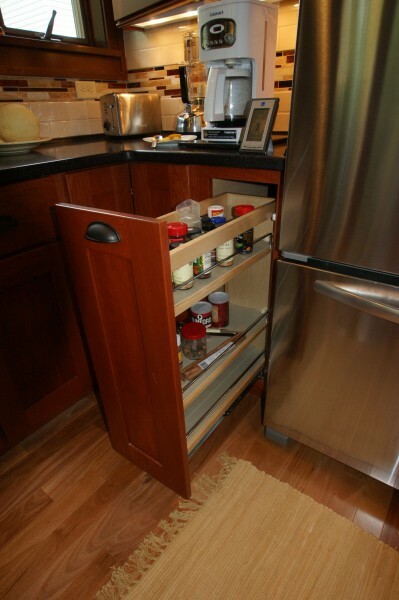 We encourage all our customers to put wire tray dividers into their refrigerator cabinets. 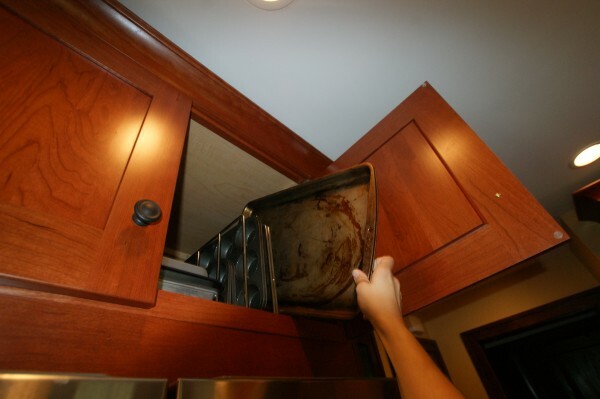 Even vertically challenged people, such as this home owner, are able to reach into their refrigerator cabinet to get their cooking sheets, muffin tins, cooling racks, and light weight cutting boards without difficulty! 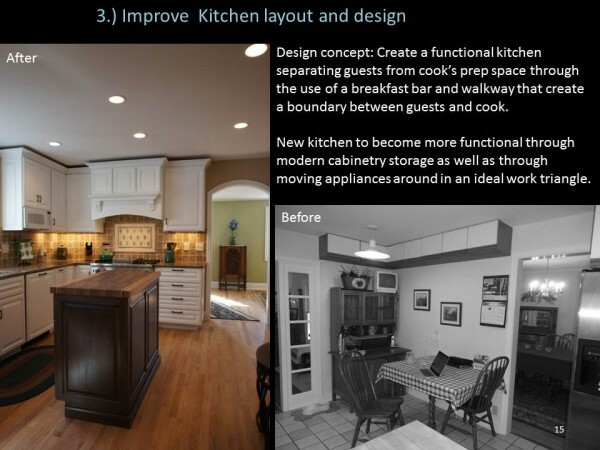 In the end, this kitchen renovation which swapped spaces was the right choice for this homeowner. 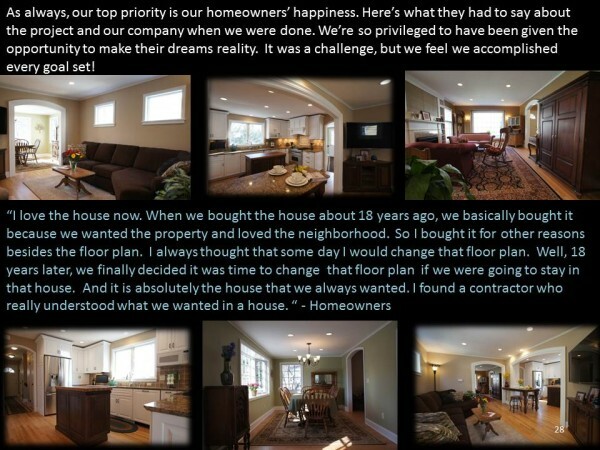 They now have a home they love. 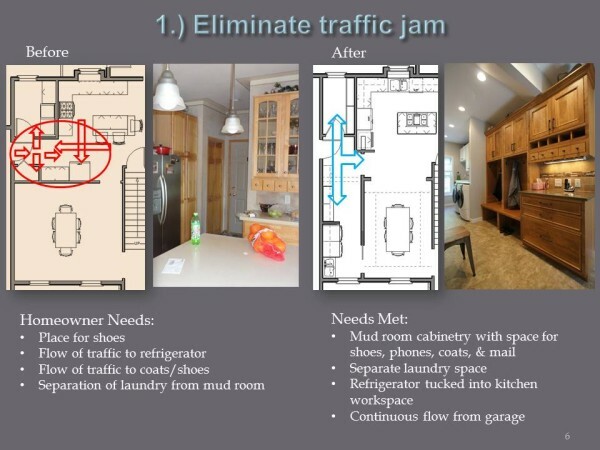 The homeowners of this project wanted to update their kitchen without completely ripping it apart. 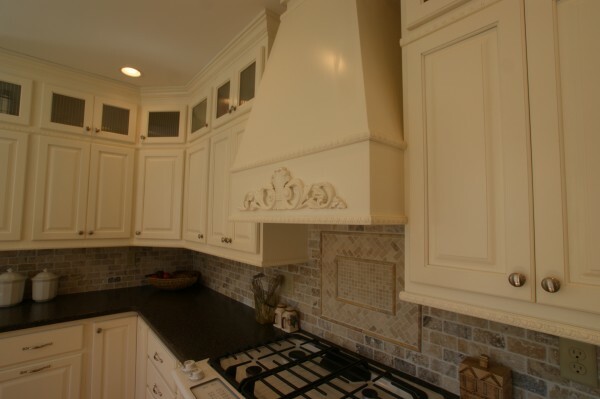 We did face lift kitchen remodel. 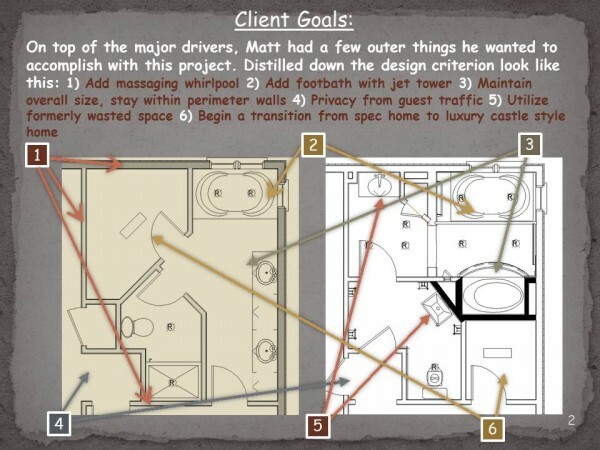 They had many goals for this project. 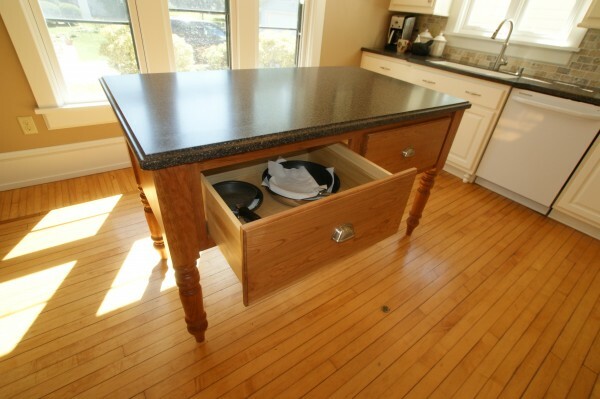 First, replace the existing island with something sturdier. 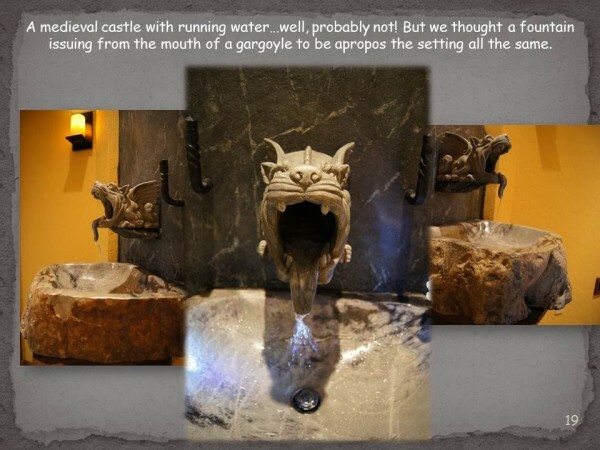 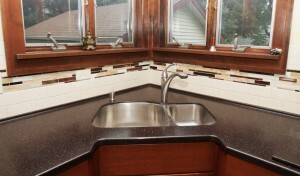 Also replace the existing counter tops with granite. 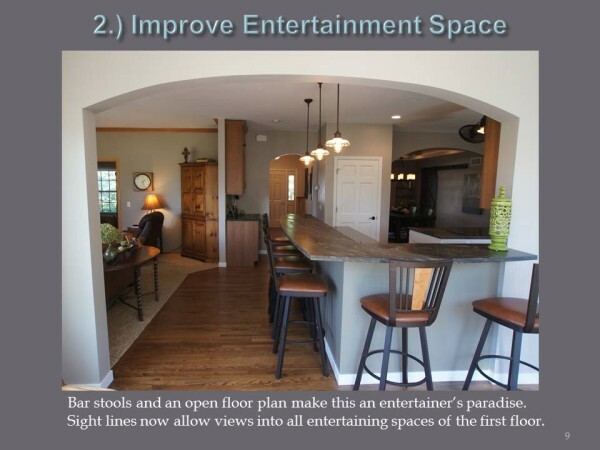 Next, they wanted a casual seating area around the island for breakfast, game playing and watching TV. 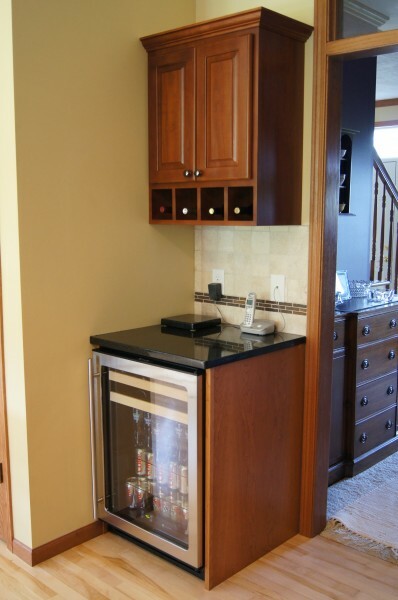 Adding in a beverage center would help with entertaining. 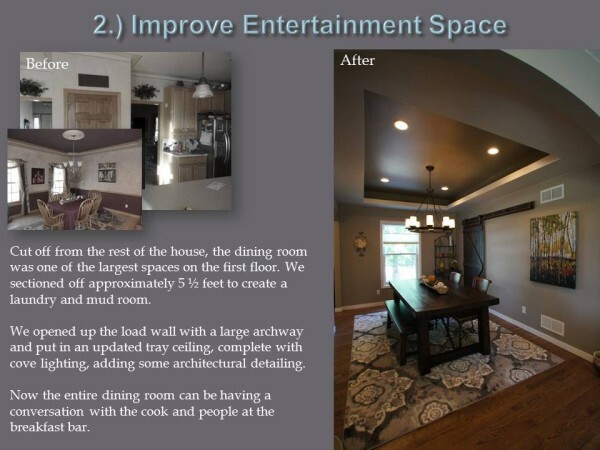 Lastly, the homeowners wanted to add some pizzazz to the space to attract future home buyers and make the space look more finished. 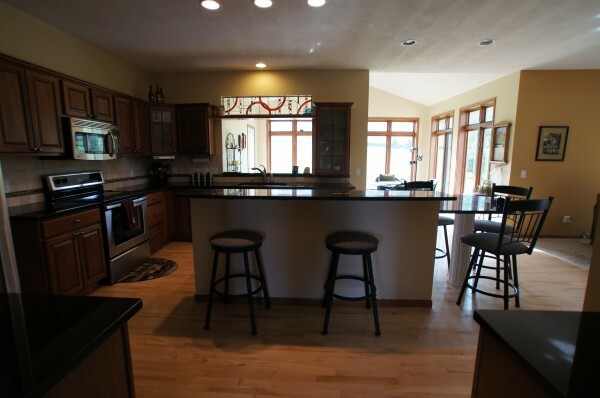 We replaced the small island with a large island of contrasting color, complete with bar height breakfast bar, cabinets with drawers and roll out trays from Shiloh Cabinetry, as well as a statement peninsula of Titanium Granite for seating. 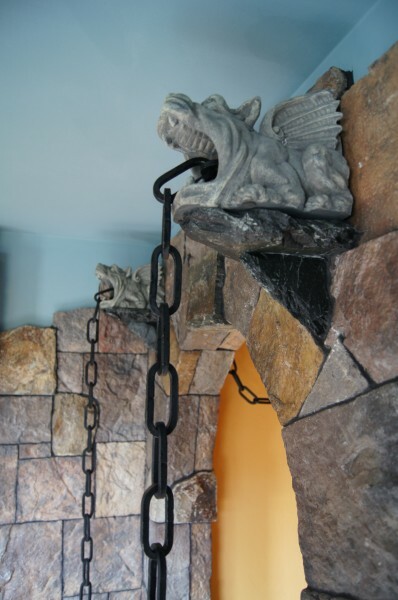 The pedestal support for the peninsula mimics the fireplace in the adjacent living room. 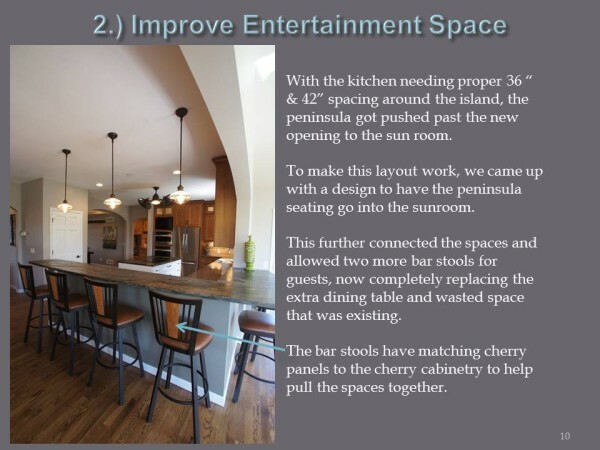 In addition, the contrasting wood helps lighten the space up and makes the large island feel less bulky and more of a focal point. 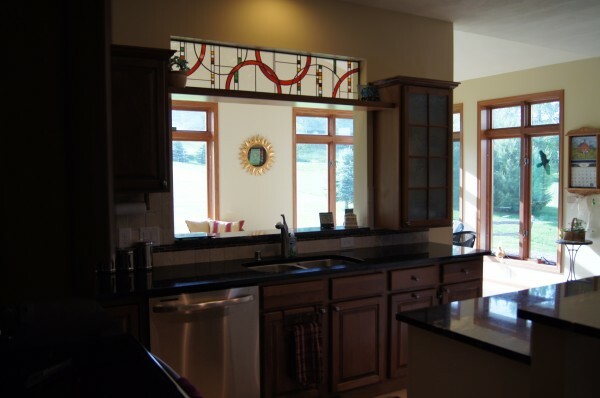 A transom stained glass panel was added in the opening facing the breakfast room which helped bring some color into the room that becomes a focal point. 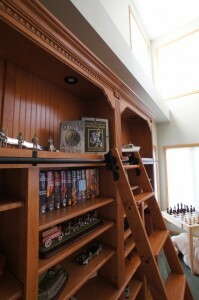 We added a shelf below it for placing art pieces and decor. 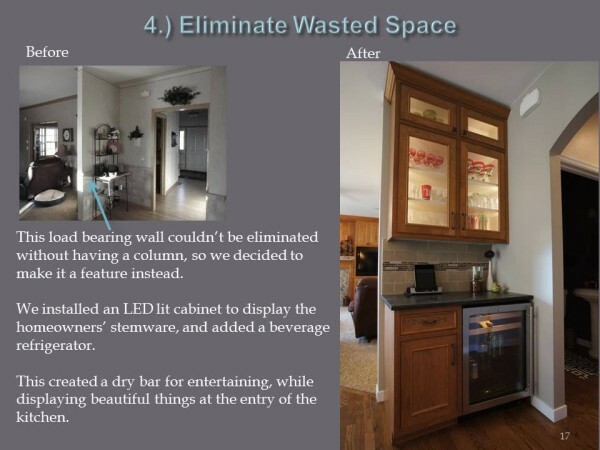 We replaced an old desk area with a beverage center. 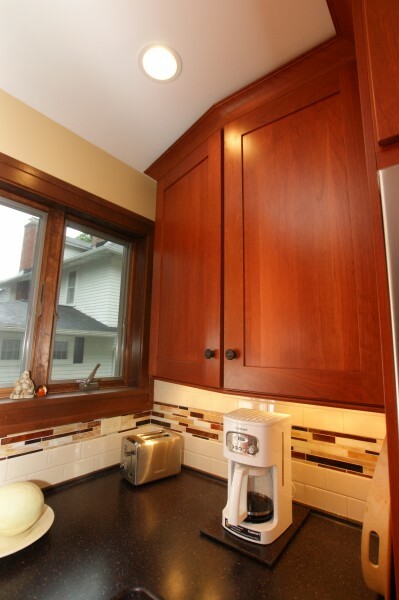 We also ordered new custom built cabinetry to match the existing cherry kitchen cabinetry. 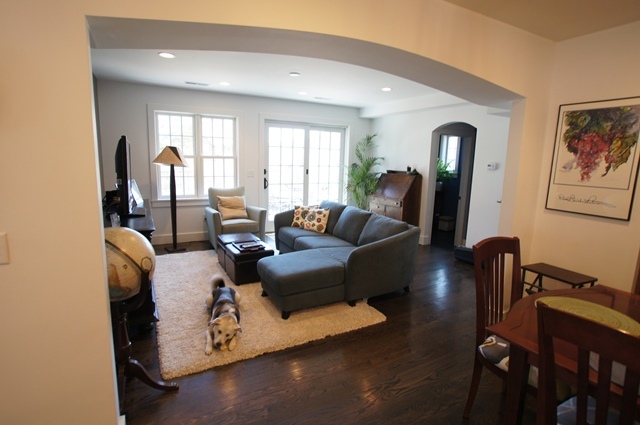 The floors were finished with UV finish – a finish that does not fade over time or become darker – instead the sun’s rays make it more durable, which was excellent for this family with a Wheaten Terrier. 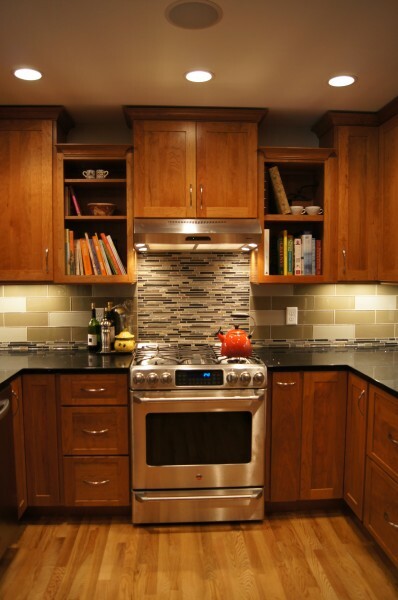 Finally, we added back splash – travertine and a glass mosaic blend, which gave the space a more finished look. 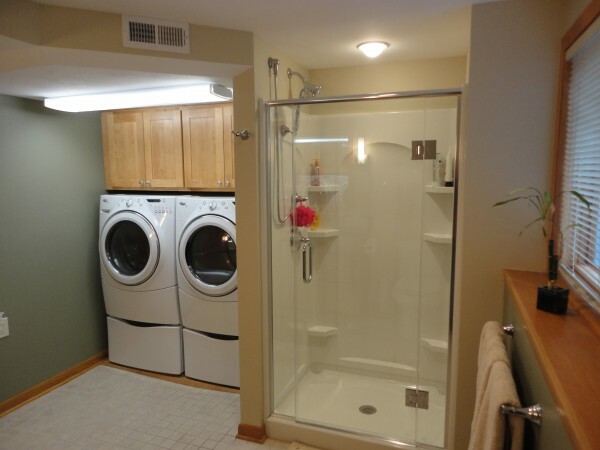 Our clients had a cramped and dark basement laundry and bath that needed improvement. 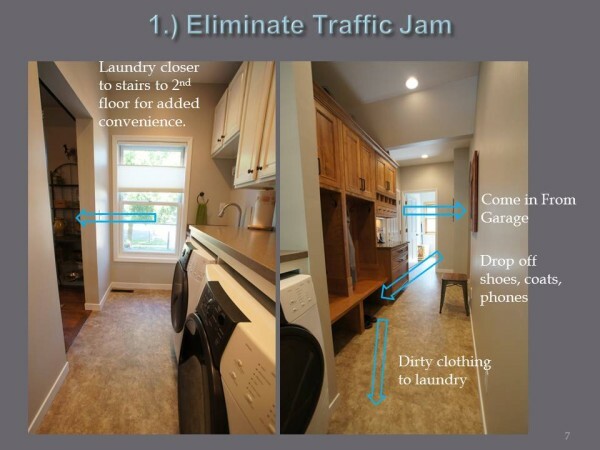 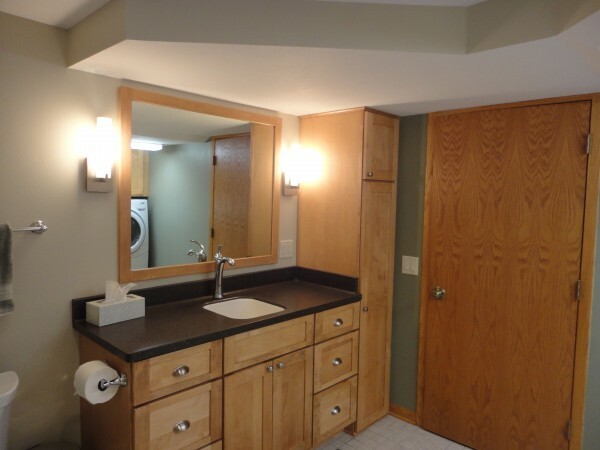 Their goals were to make the basement laundry room feel more spacious and comfortable for doing laundry tasks while improving the showering area and providing more bathroom storage for their lower level guest suite. 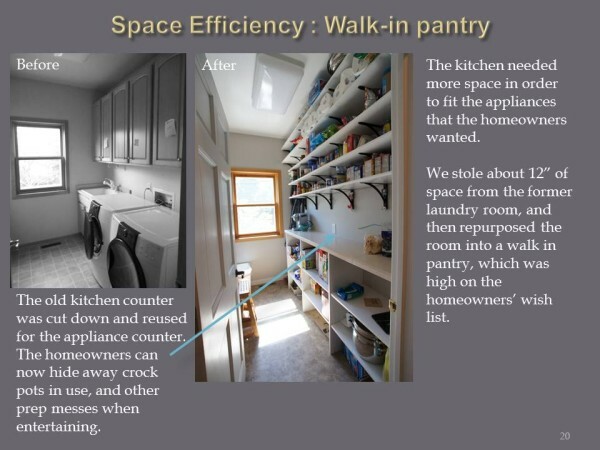 Another goal was to add more overall storage to the space. 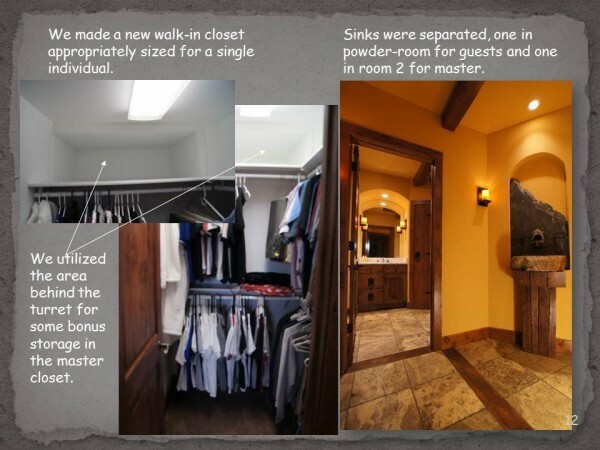 The existing walls closed the owner into a small dark hallway. 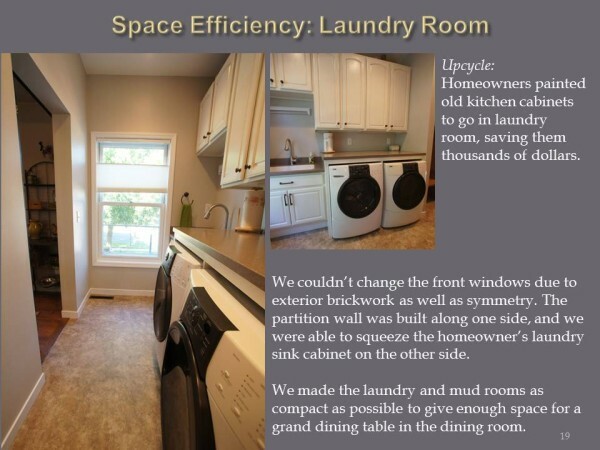 We rearranged the washer and dryer and opened up the space by getting rid of walls and closet doors that separated the spaces. 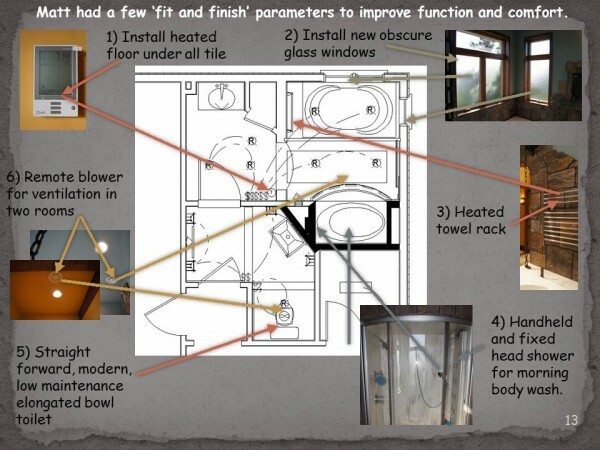 Now the bathroom is far more functional, with a brand new Kohler shower module and custom glass shower door as well as a convenient laundry area with great storage above. 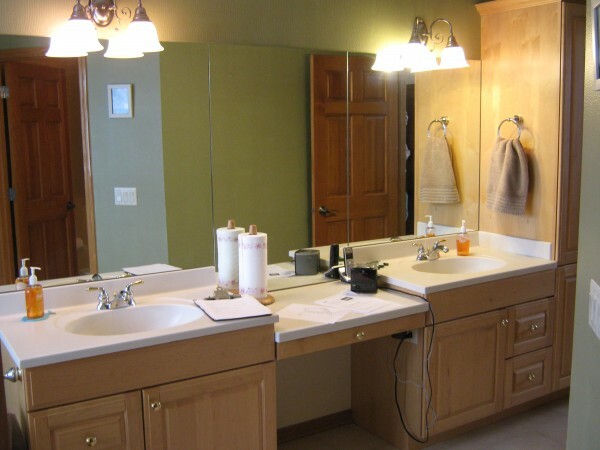 In addition, a large vanity with utility cabinet holds more cleaning supplies. 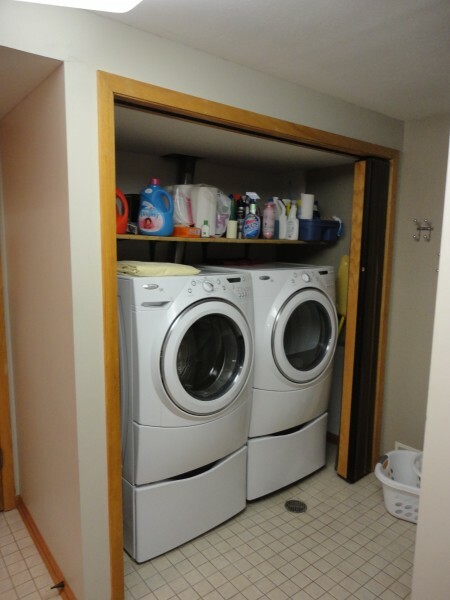 It becomes very surprising that this brightened space is in the basement of the tri-level home. 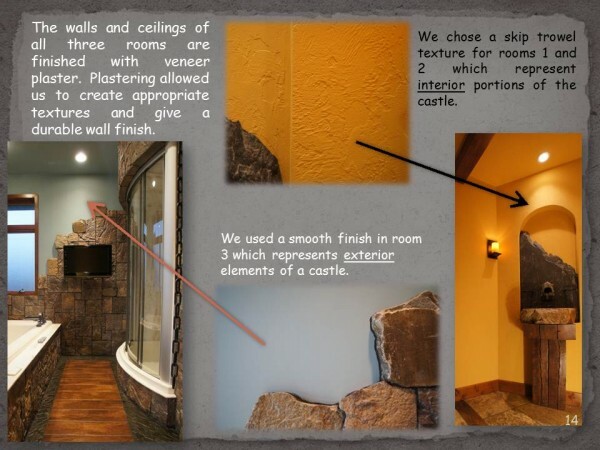 The client chose warm green and brown earth tones for the room. 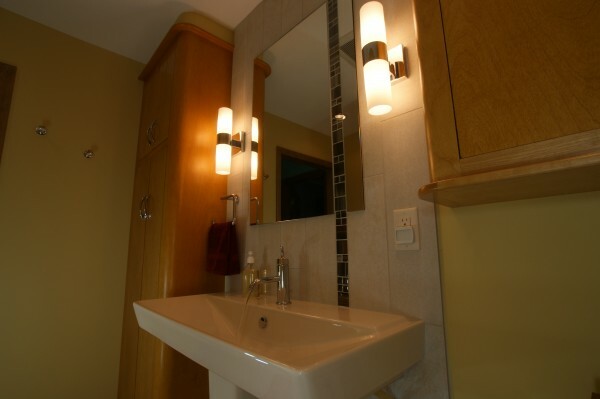 This gives the space a very updated yet relaxing feel which will be appealing to future home buyers. 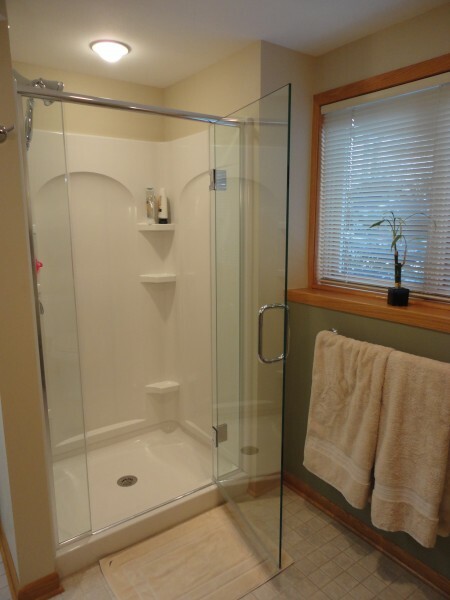 The custom glass door gives the shower a more polished look. 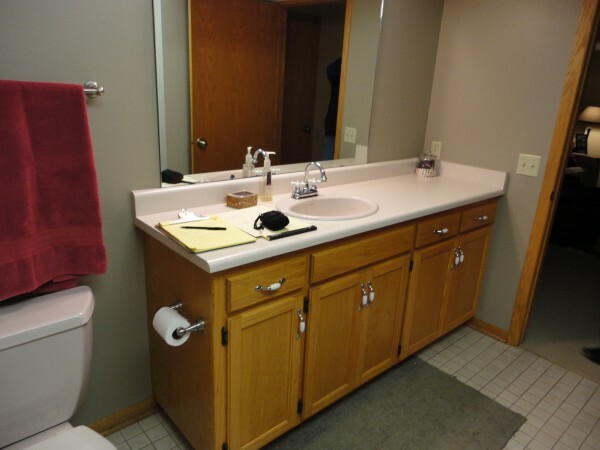 These homeowners can now enjoy a more functional, easy to use area for years to come while providing their guests a nicer bathroom space. 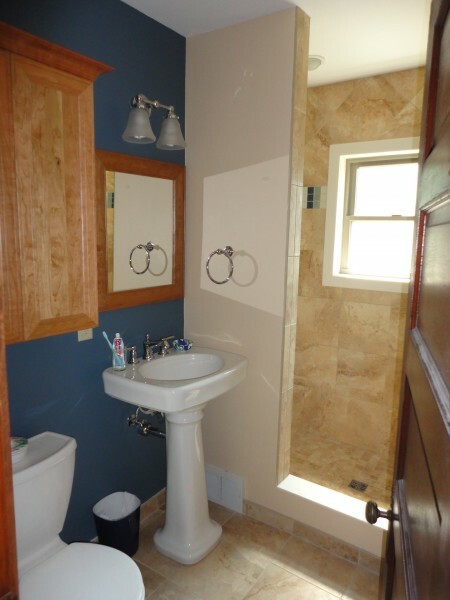 To see more project photos, visit our Laundry & Mud Rooms page or our Bathrooms page. 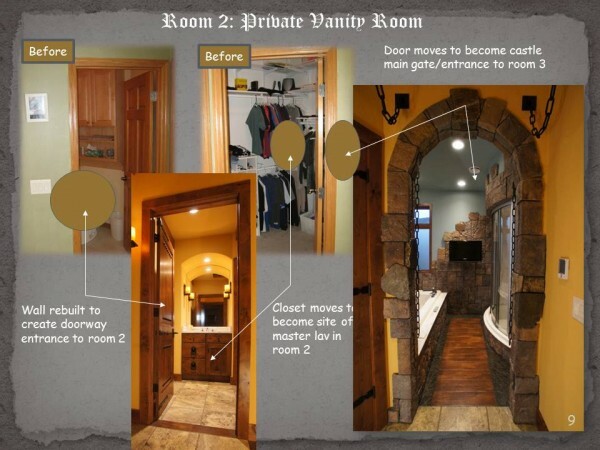 This Victorian home in Madison, WI has gorgeous woodwork – wainscoting, two fireplaces, paneled doors, built in wooden seating, and many decorative carvings. 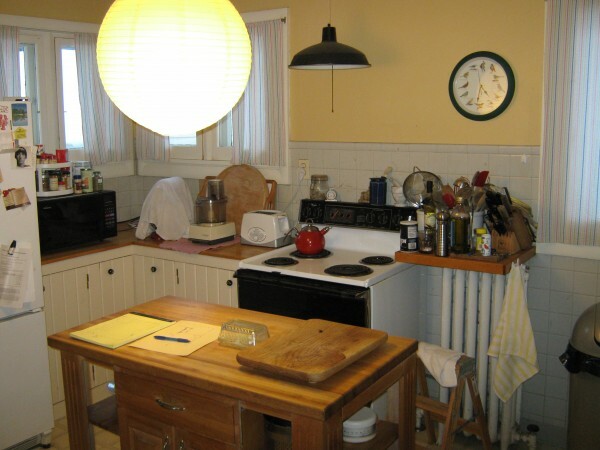 When we entered the kitchen, however, we were shocked to see wood paneling, wallpapered soffits over their 1970’s cabinetry, and no beautiful Victorian woodwork. 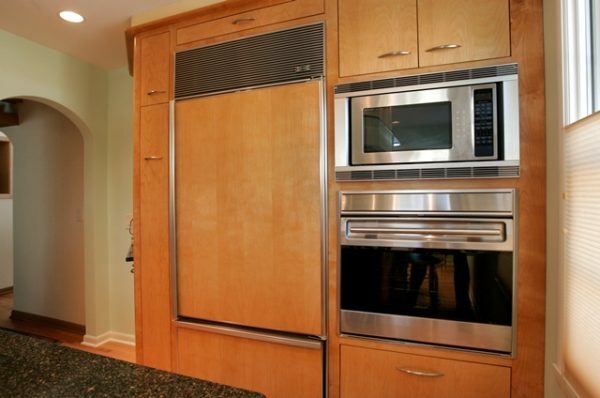 Everything stopped at the entrance to the kitchen. 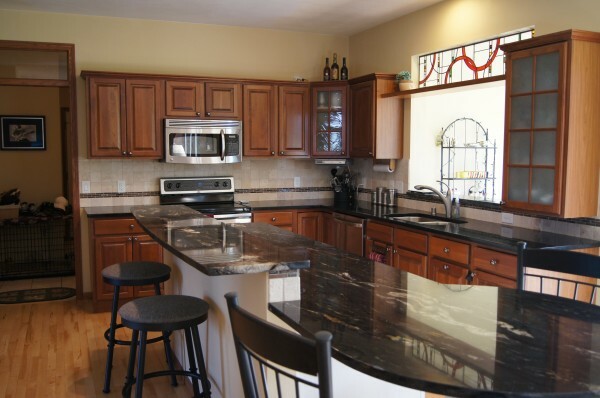 The homeowners, who love their hobby of a house, wanted to make the kitchen feel like it was original and beautiful like the rest of their home. 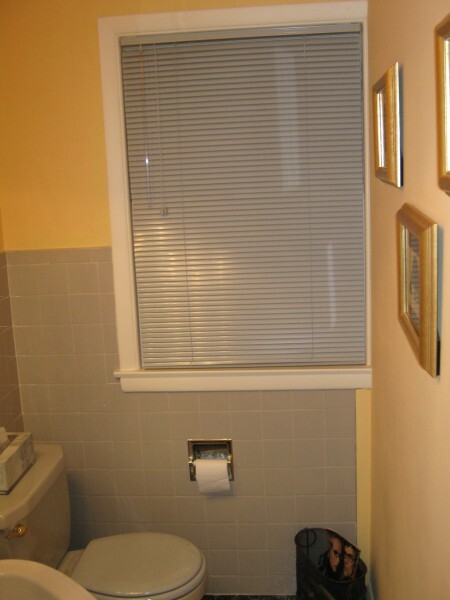 They had just replaced some windows, so those needed to stay. 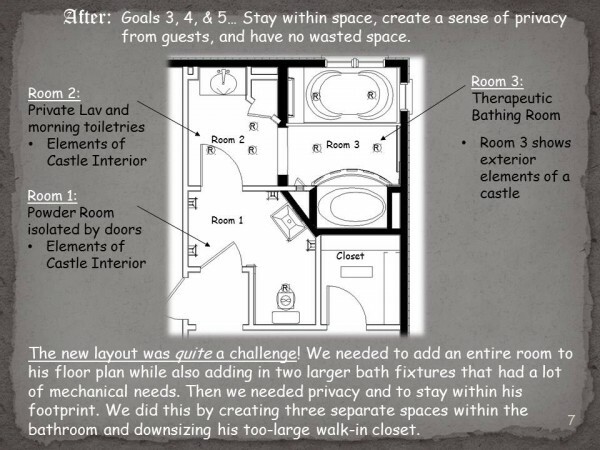 They also wanted an overall more functional space than what they had. 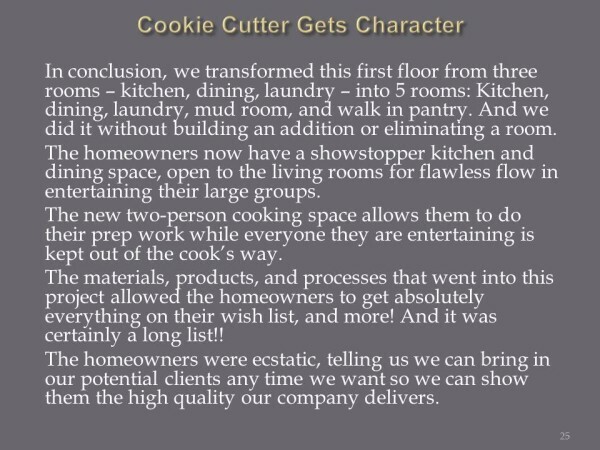 First, we gutted out the entire kitchen and laid out the space to work with the windows and door openings where they were. 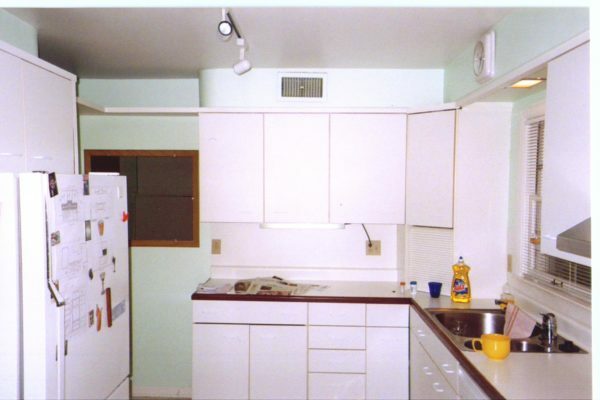 The homeowners chose white casing and Dover White cabinetry, which was a common choice for older kitchens. 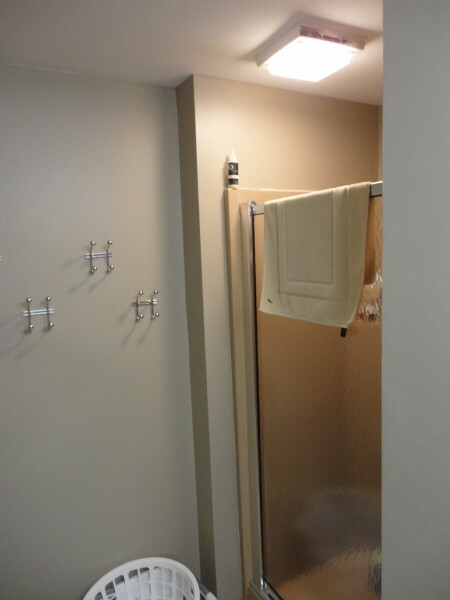 Next, we relocated a pipe that was concealed within a soffit. 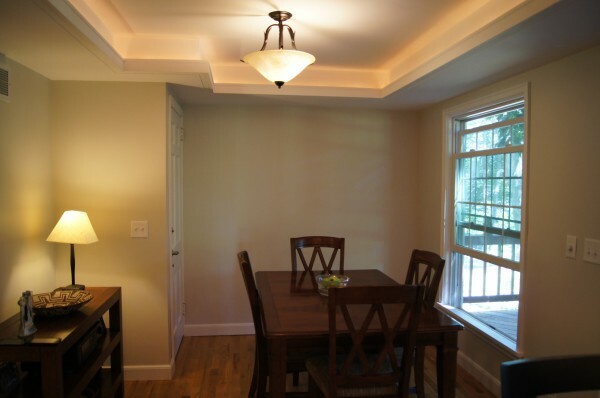 As a result, the ceiling could again be full height like in the dining room and entry way. 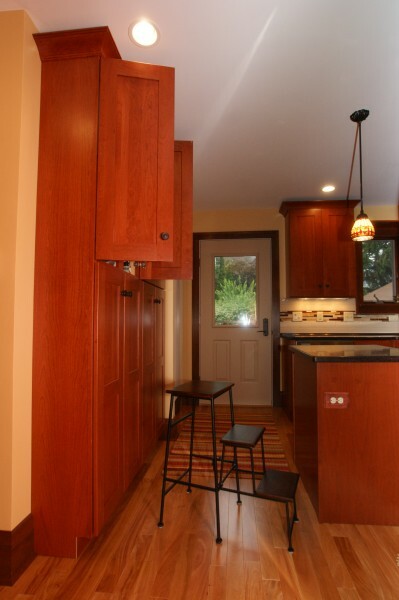 With the new high ceilings, we had enough space to do stacked wall cabinets all the way to the ceiling. 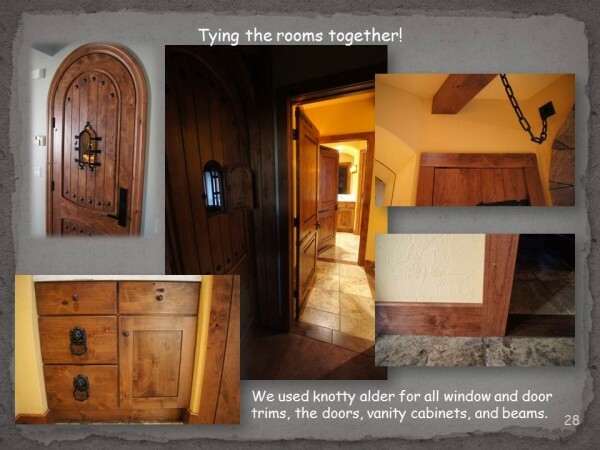 We found inspiration for all of the woodwork in the other rooms of the Victorian home. 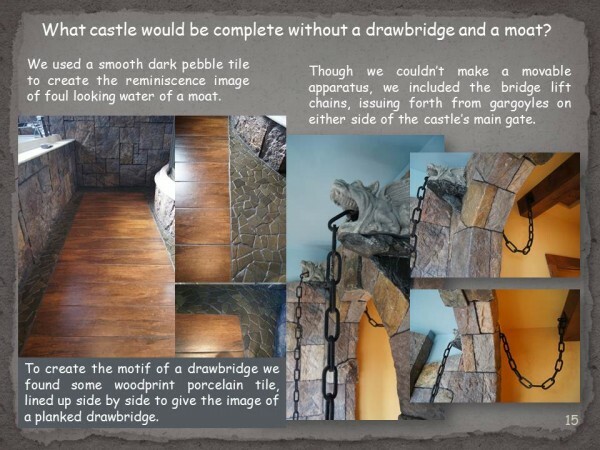 We found egg and dart molding on their fireplace, crown molding to match their door molding, and an applique for their hood as well as corbels on their island that mimic the curvature in some carvings in the entry way. 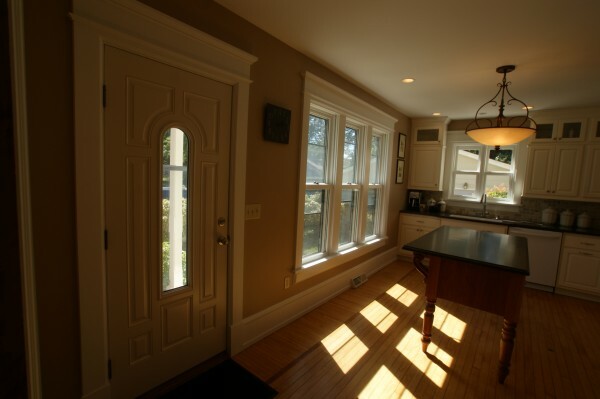 The new exterior door with an oval of glass mimics the style of the front entry doors. 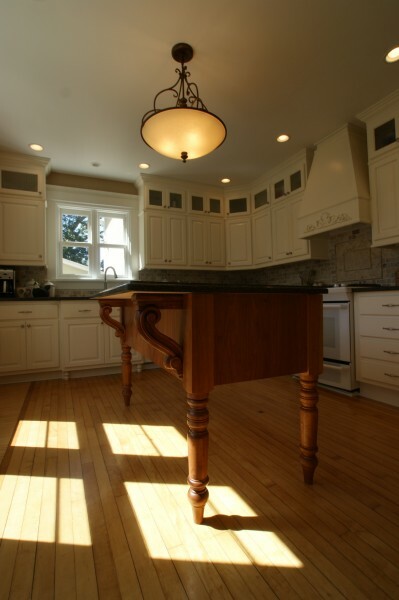 Lastly, the couple wanted an island that looked like a table so that their original wood floors would be more visible. 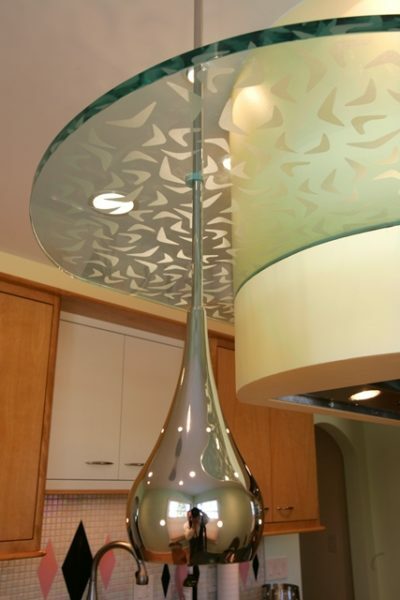 They also wanted it to be a contrasting wood. 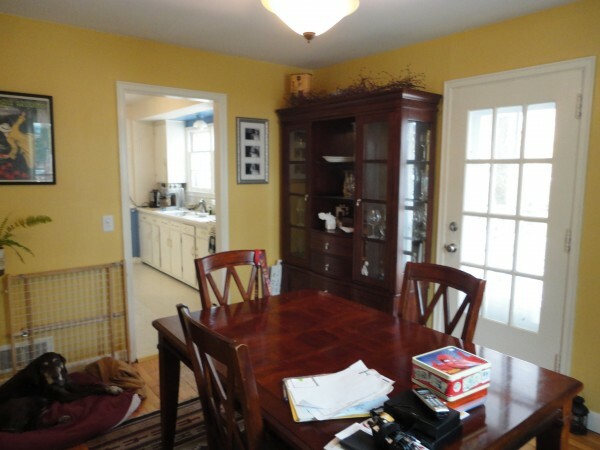 We chose the birch wood and stain color found in an adjacent living room. 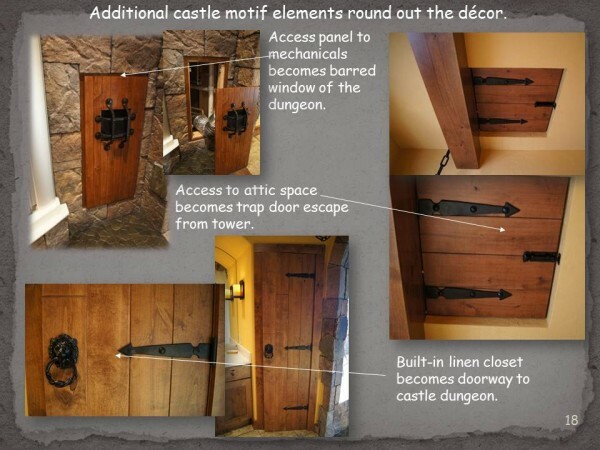 In addition, our woodworkers put together some window casing to match the other side of the dining room entry. 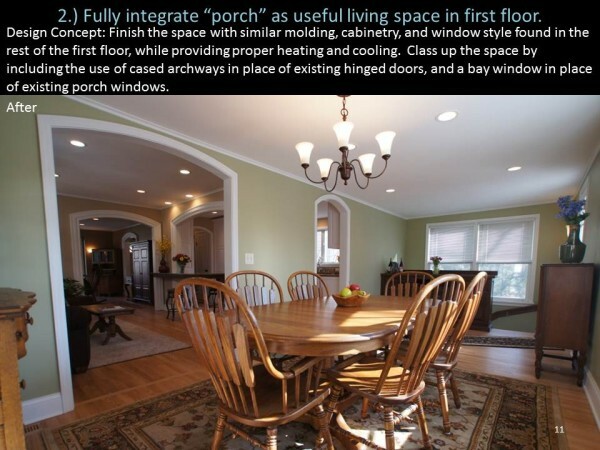 As a result, both spaces flow together seamlessly. 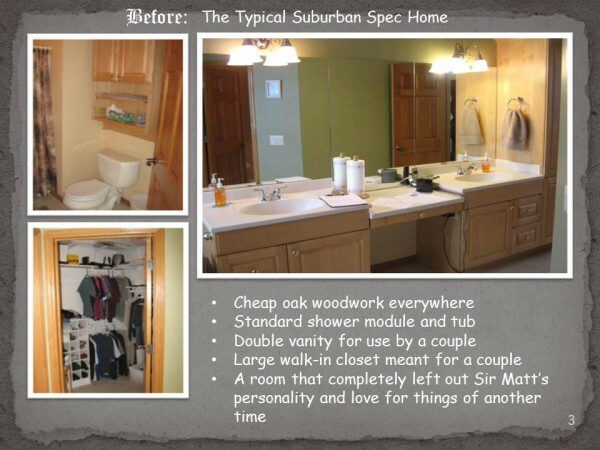 We can call this Victorian remodel a huge success! 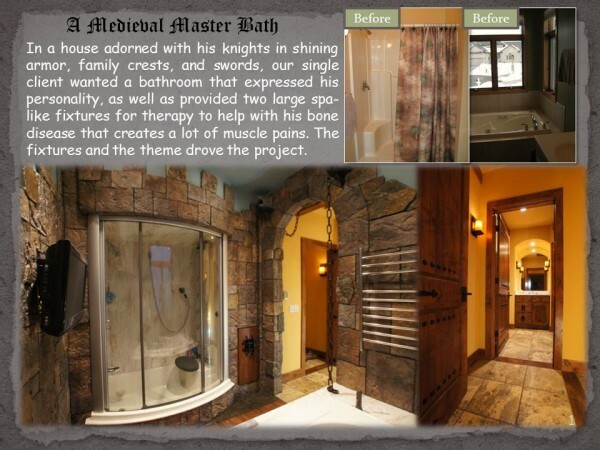 Recently, we finished a bathroom remodel in an old Victorian home in Madison, WI. 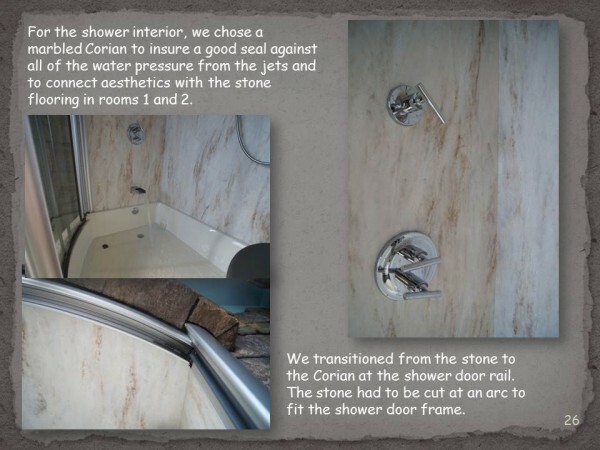 The owner of this home was tired of the look of the tub/shower module and wanted a tiled shower in the bathroom. 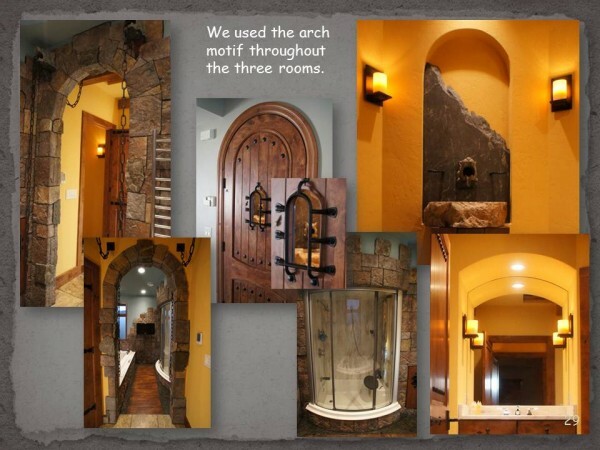 This bathroom remodel updated her space while maintaining the character of the home. 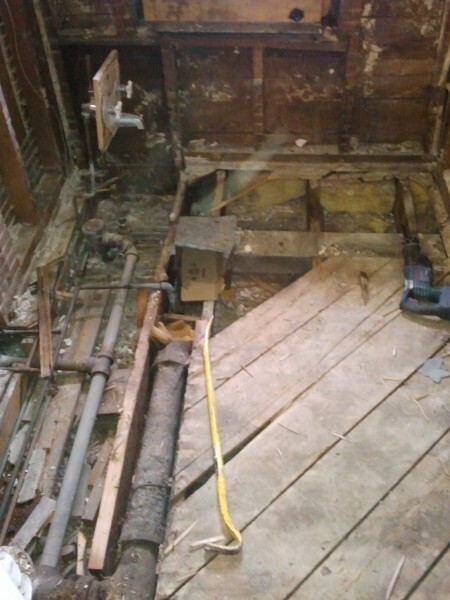 To our surprise during demolition, we found that years ago, a previous owner had sawn through all of the floor joists and many studs in the bathroom walls in order to get plumbing and HVAC through to the current locations. 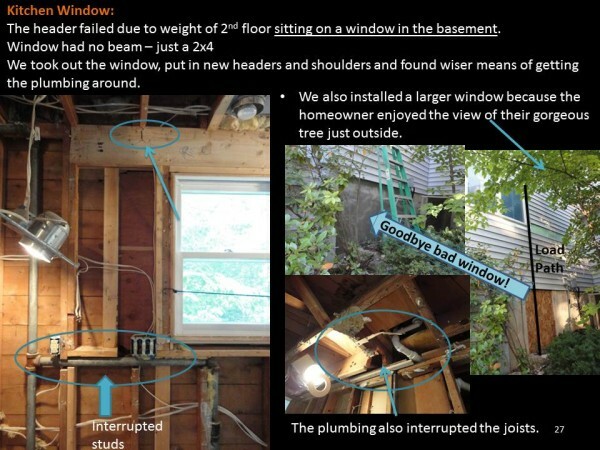 Definitely a case of “Do Not Try This At Home.” 🙂 We relocated the plumbing pipes and HVAC to restore structural stability. 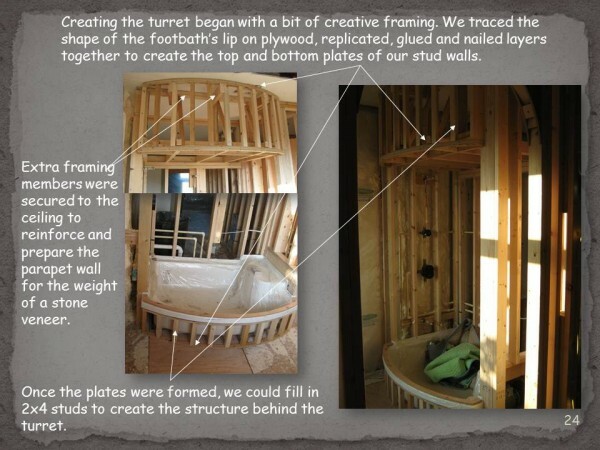 Once the structural issues were covered, it was on to creating a gorgeous main bath for the owner to enjoy. 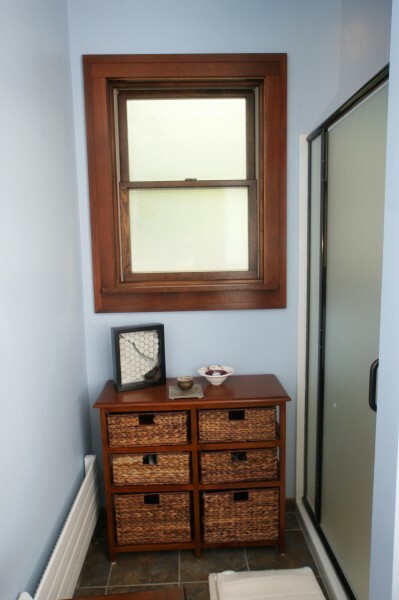 To go with her original woodwork found throughout the home, the owner chose natural cherry cabinetry that would get richer with time, just as her house’s woodwork has. 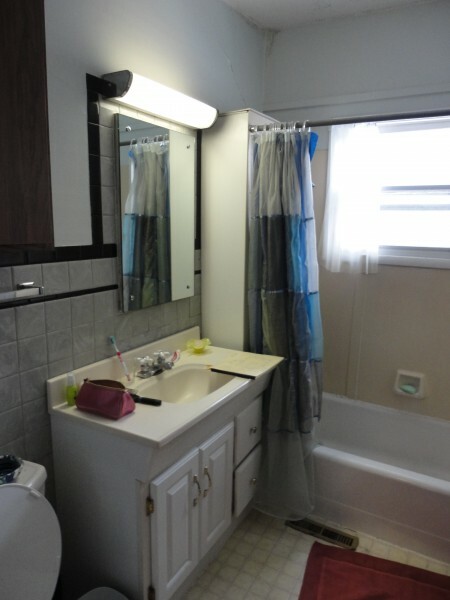 We also managed to strip her door on the bathroom side (previously painted white). 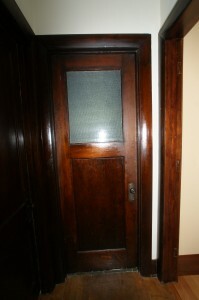 We stained it to match the existing woodwork found throughout the house. 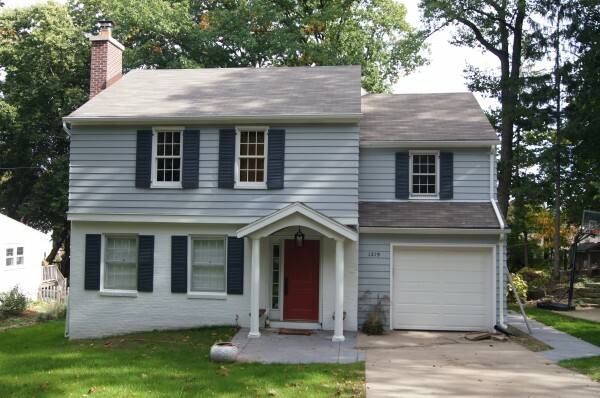 The trim didn’t match the rest of the house, so we duplicated the trim that was on the other side of the door. 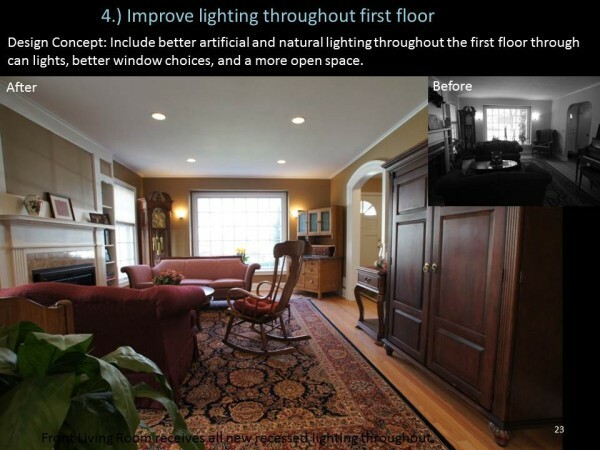 This creates a space that looks more original to the Victorian home. 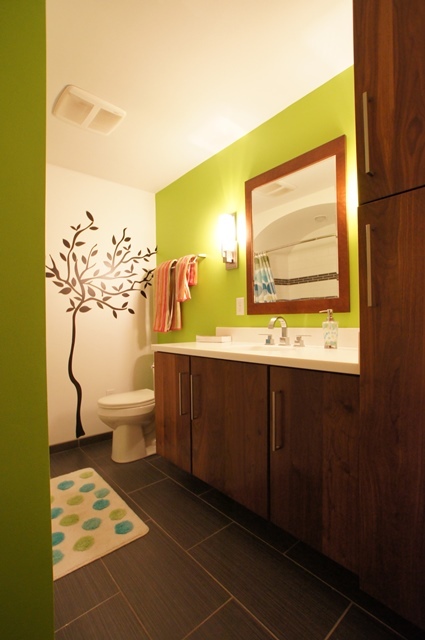 The colors of the cabinetry are also in the floor and shower tile, pulling everything together. 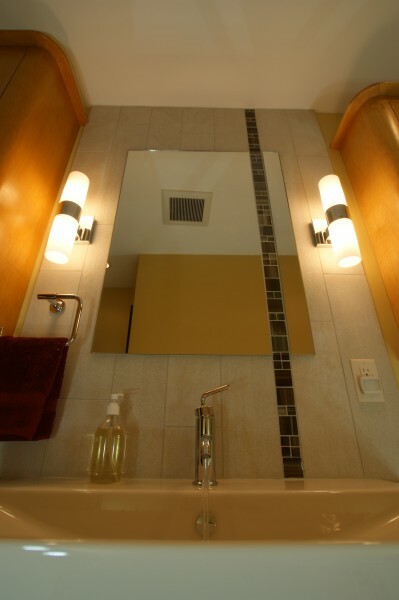 We even found a paint color to match one of the colors in the glass mosaic. 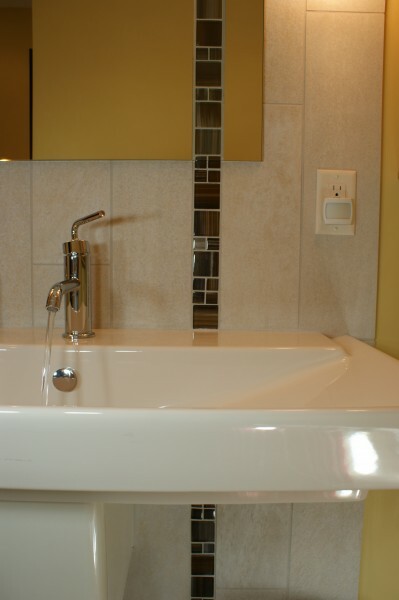 The vanity wall is an accent wall. 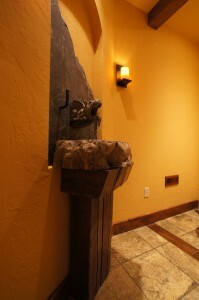 We kept the dark blue color on that one wall to maintain an open feeling. 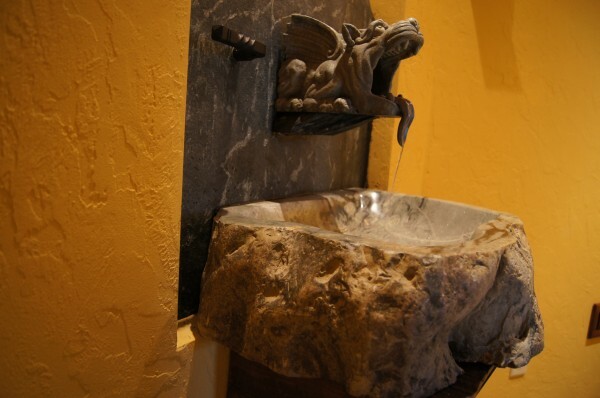 This creates a focal point at the sink. 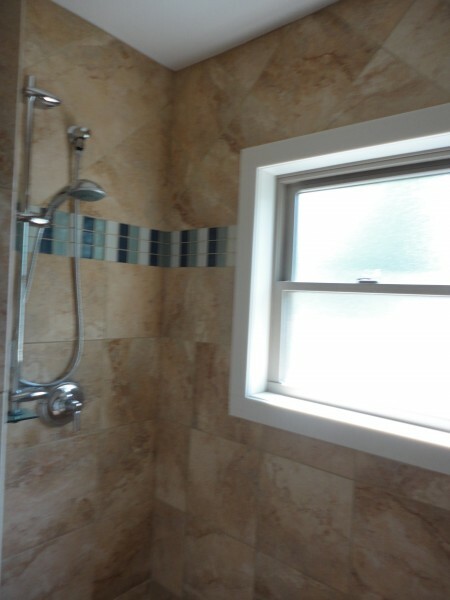 We also replaced the window that was in the shower with a waterproof window. 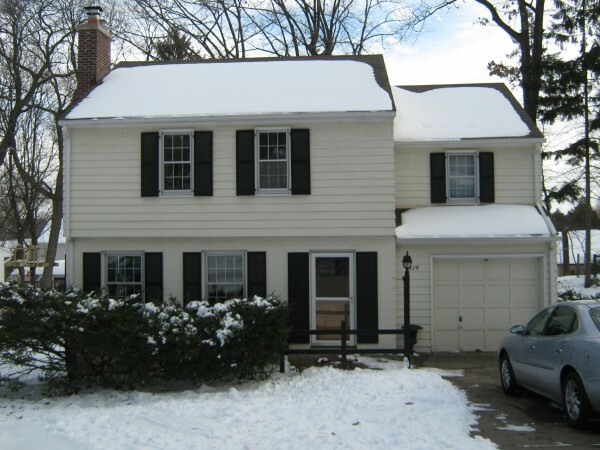 Now the owner can enjoy a nice, cool breeze. 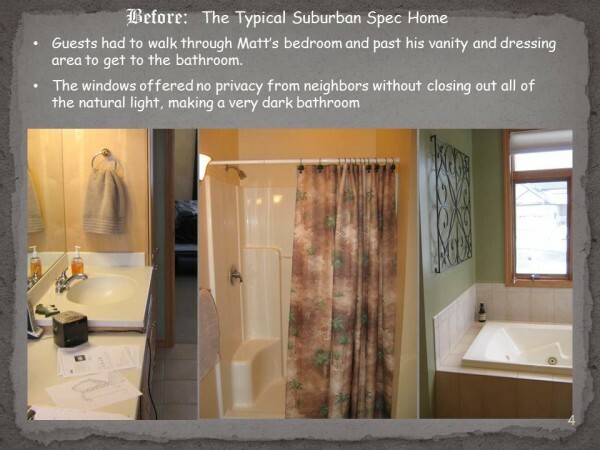 Along with their Craftsman kitchen remodel, this homeowner’s cramped, small bathroom was in need of a serious renovation. 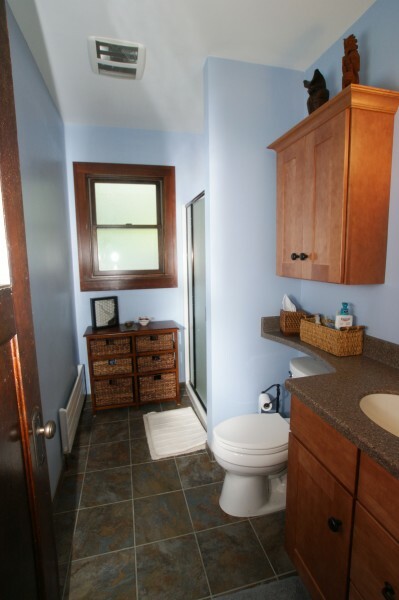 This craftsman style home was built in the early 1900s and the small bathroom had its original mudset tile. 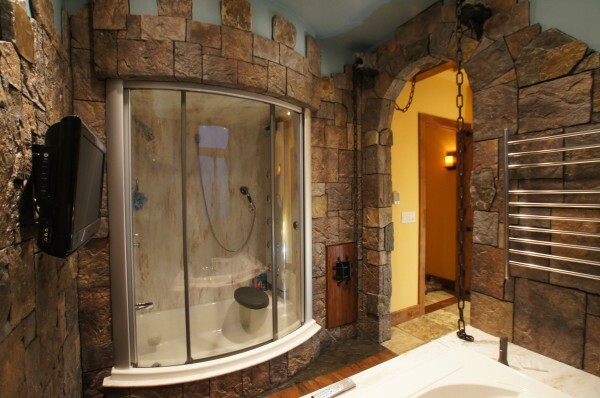 The homeowners decided that they would like a walk-in shower rather than the cast iron tub that had existed. 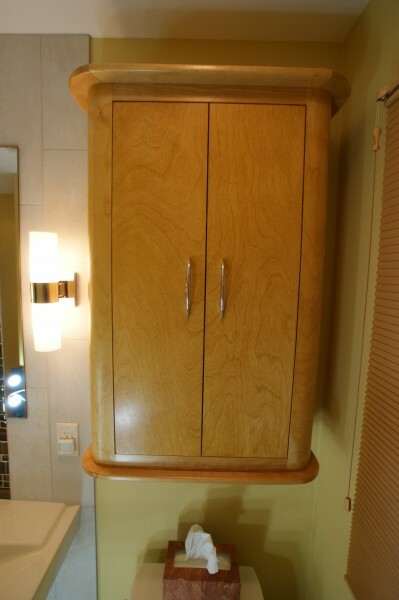 They were limited in counter top space to a tiny vanity and radiator cabinet. 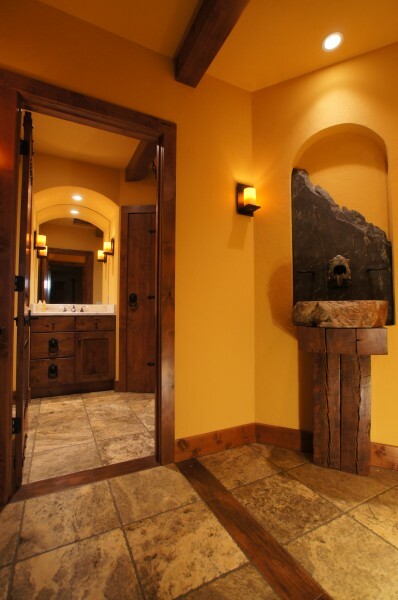 The slate flooring pulls in colors from the walls and cherry vanity cabinet, creating a sense of flow throughout the room. 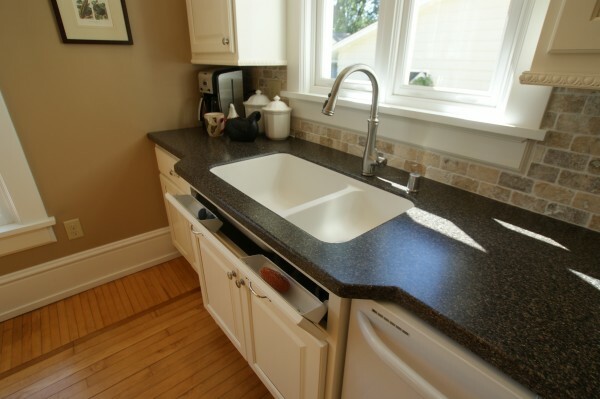 Extending the counter top as a banjo top over the toilet gave these homeowners as much counter top space as possible. 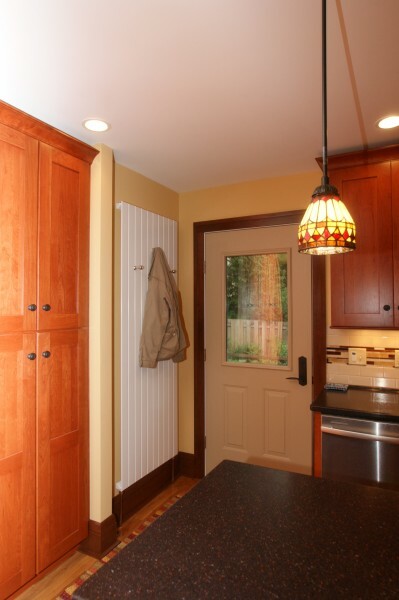 We replaced the radiator and its cabinet cover with a small wall radiator that is more energy efficient and space-saving. 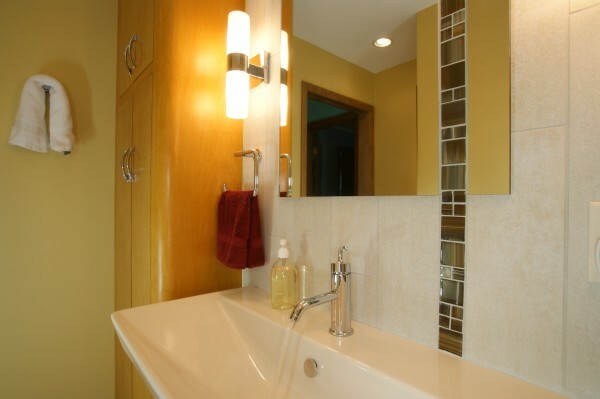 The homeowners found that they actually had extra space near the shower to place a small console table. 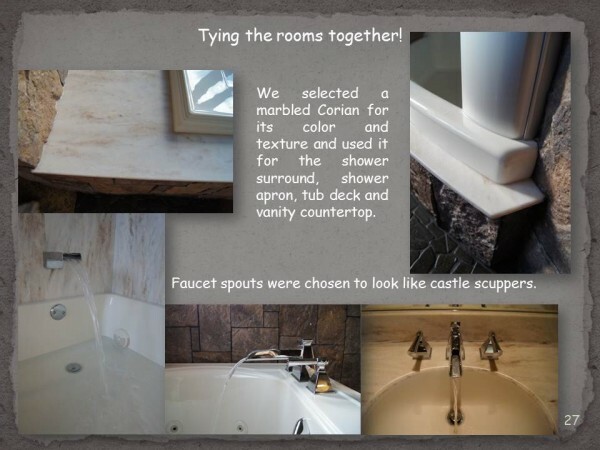 It houses extra bathroom accessories as well as displays more of their artwork, including the shadow box we created as a Thank You present. 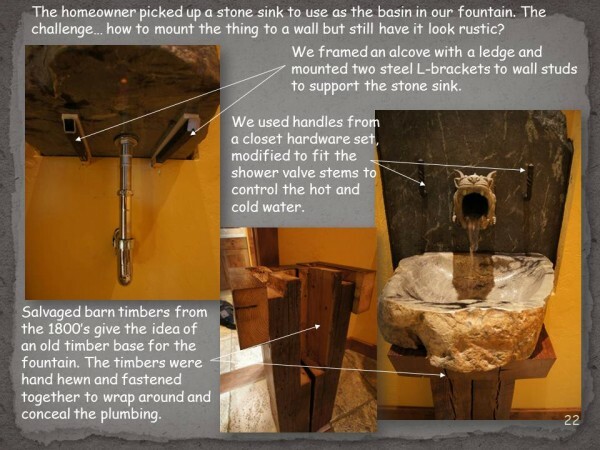 The woodwork that we carried into their Craftsman Kitchen was also carried into their bathroom. 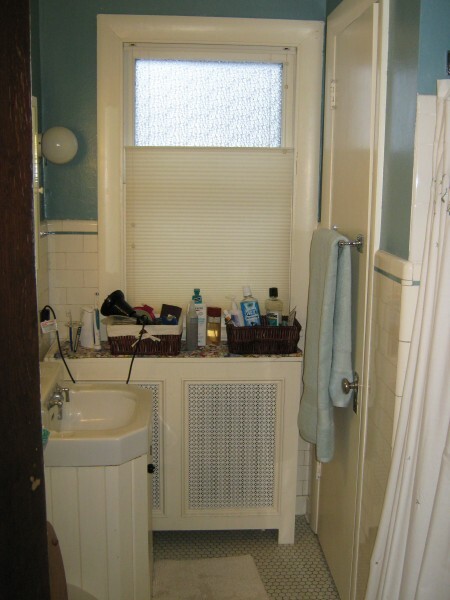 The new window has obscure glass to match the original door and new shower door. 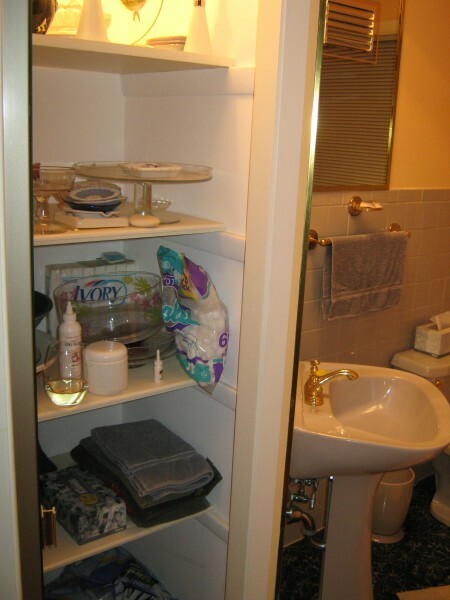 Before the remodel, the interior side of the bathroom door had mismatched hardware and a board covering the recessed panel detailing found throughout the door. 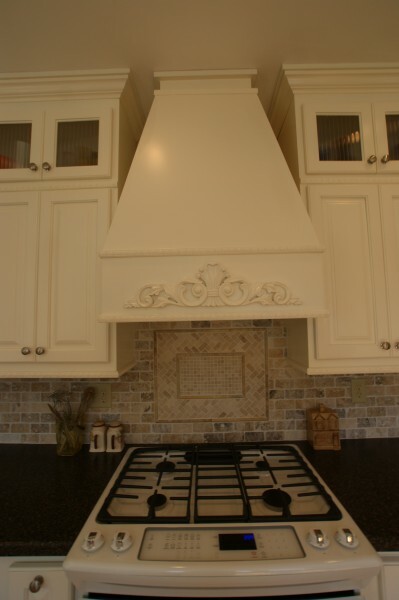 On top of that panel were several layers of white paint. 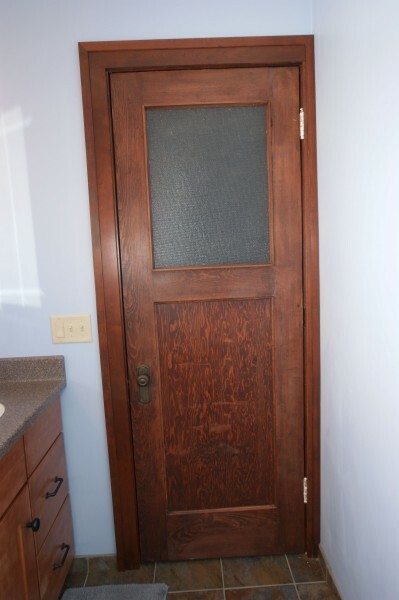 We managed to get the door stripped and re-stained to match the existing woodwork, bringing the old house character to a side of the door the homeowners had no idea had a hidden recessed panel. 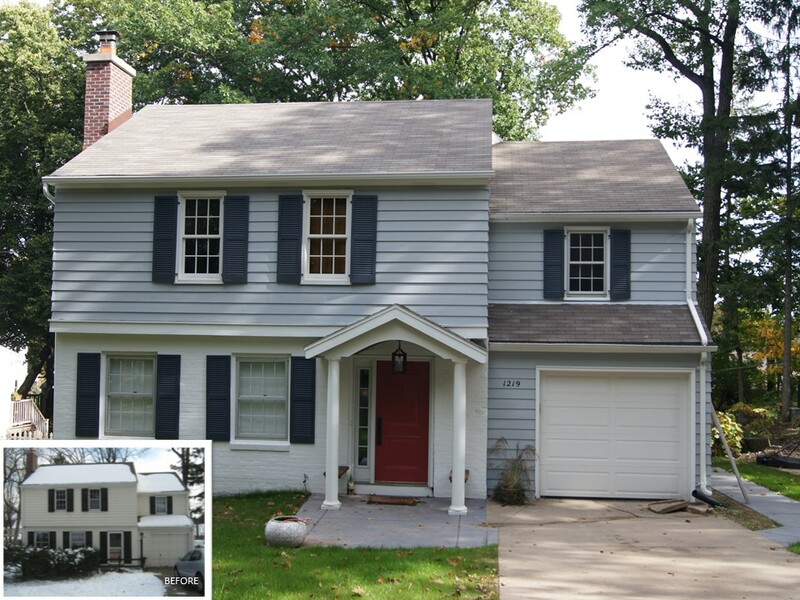 Since completion of their kitchen and bathroom project, these homeowners also tackled the 3-season porch on the front of their home. 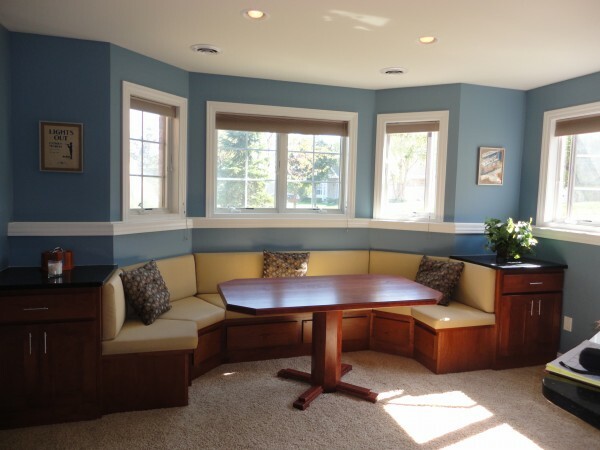 We completed the new sun room in April 2017. 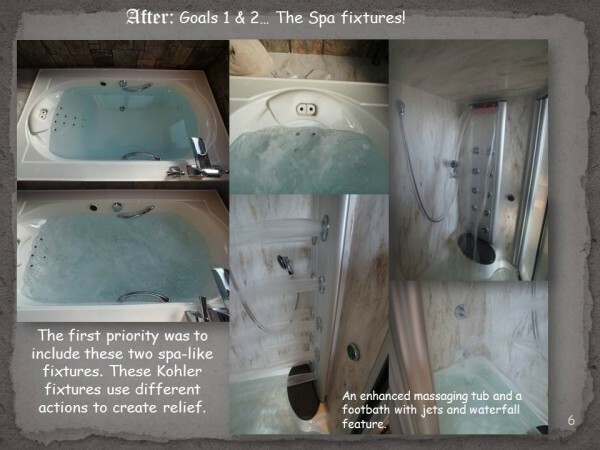 The result was a CoTY Award winning space! 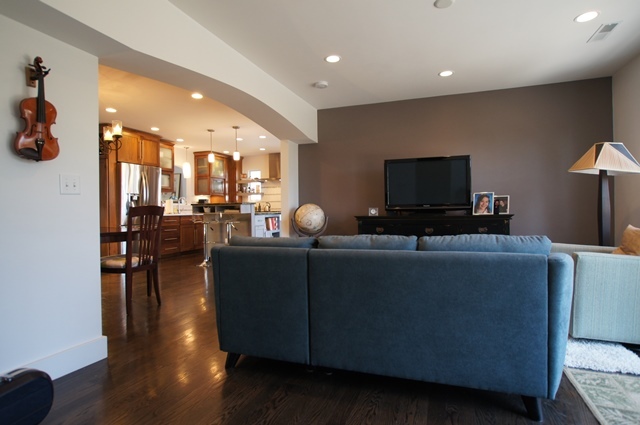 We also featured this beautiful home in the NARI Tour of Remodeled Homes in the spring of 2017. 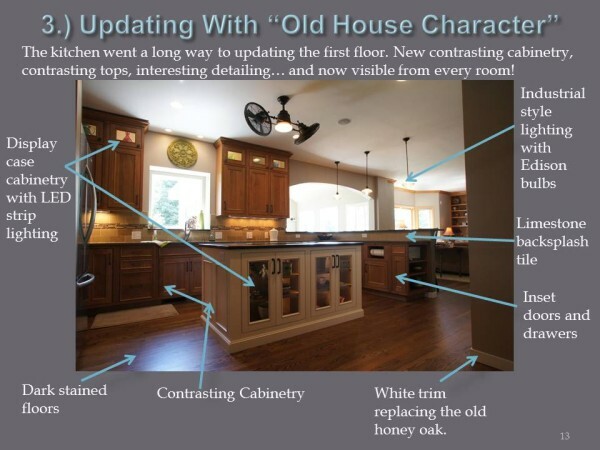 To read about their new Craftsman Sunroom check out our post Craftsman Sunroom-NARI Coty Award Winner. 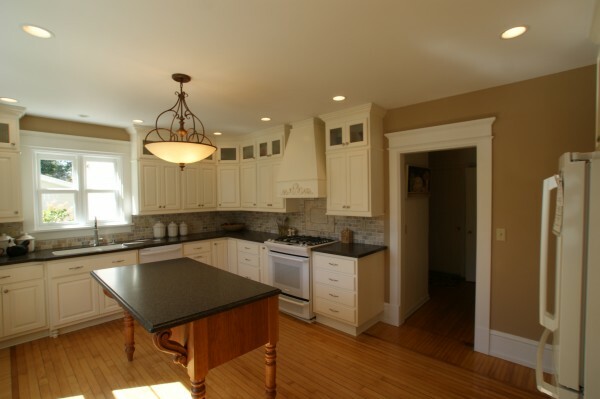 Inspired by their early 1900’s Craftsman home in Madison WI, this Craftsman kitchen remodel carries the character and detailing over from the rest of the home. 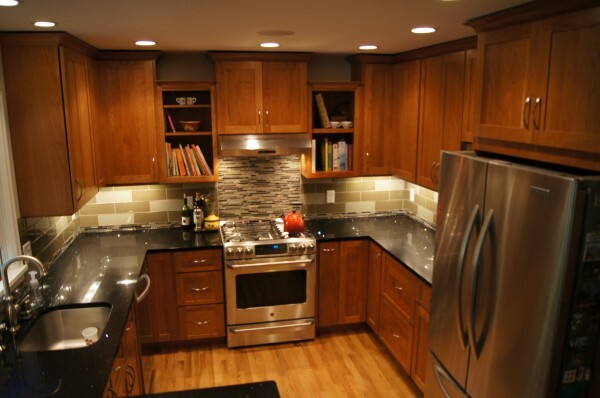 With this craftsman kitchen remodel, we managed to change the functionality of the space–storage, flow, and work space–without adding an addition. 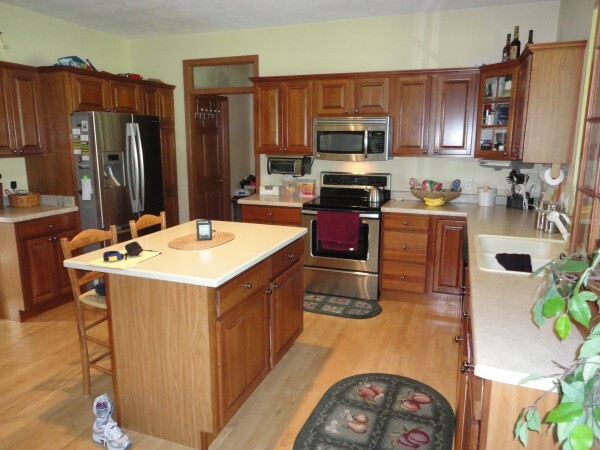 The homeowners now have the Craftsman kitchen they’ve always wanted. 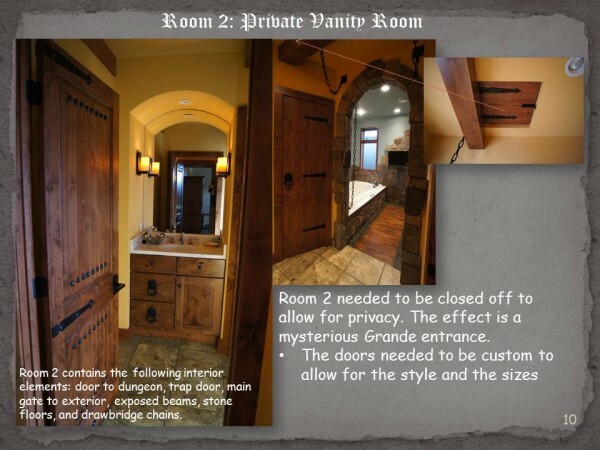 This home had unique trim designs that we had never seen before. 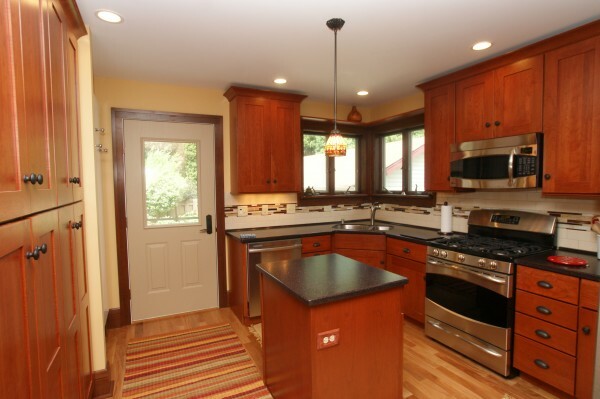 In order to continue the beautiful woodwork through the newly updated kitchen, we had to order new mill work and match the stain to the existing trim in adjacent rooms. 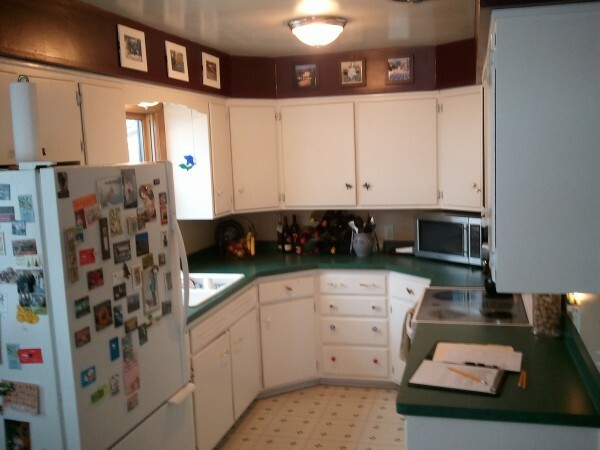 With hours of working on it, we managed to duplicate the trim. 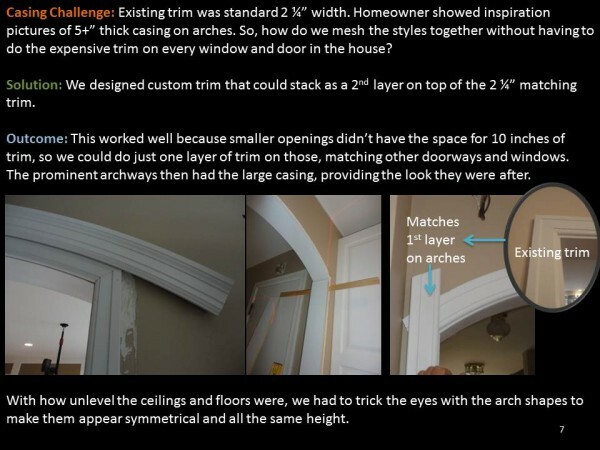 Our highly-skilled woodworker paid close attention to detail as he finished off the beautiful base boards and window trim. 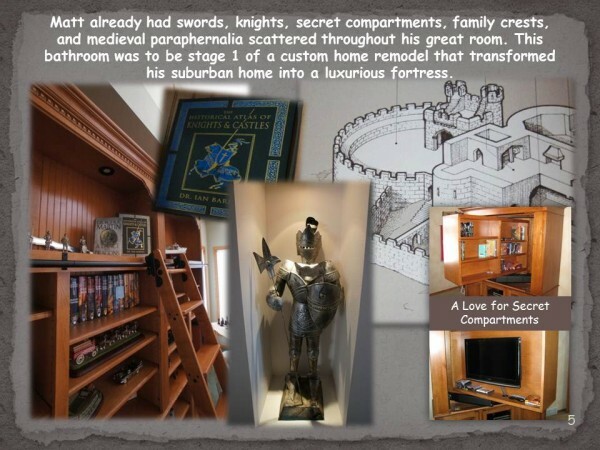 The homeowners now enjoy their window sills as a place to display some of their mementos. 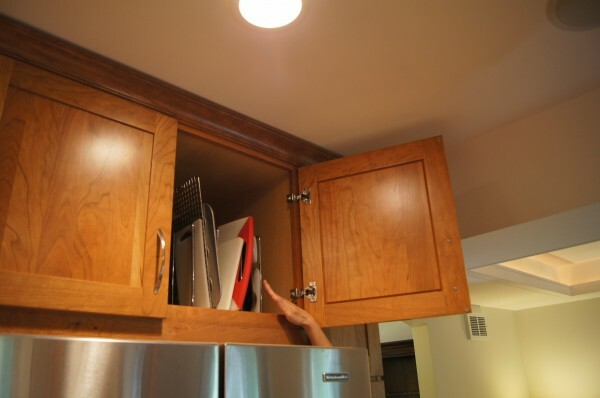 We added a great amount of storage space by replacing an unused counter top area and wall cabinets with full height pantries. 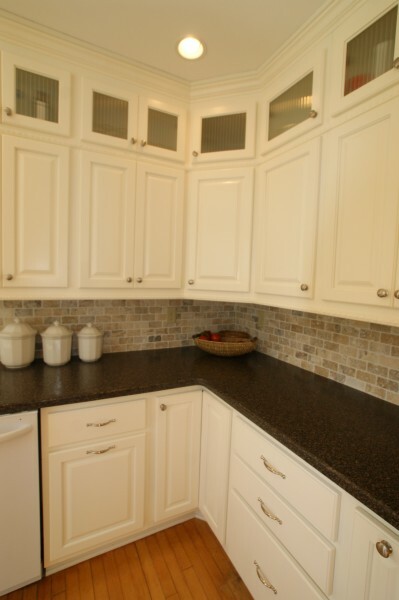 The pantries are located along the main pathway to the back door. 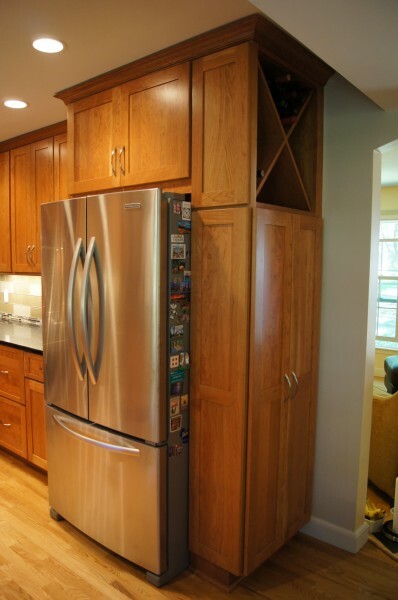 Due to their twelve inch depth, the pantries create a better traffic flow. 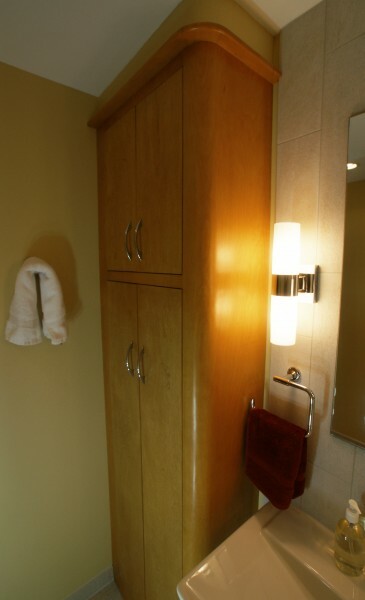 A wall mounted radiator that doubles as a coat rack is another space saving idea we used! 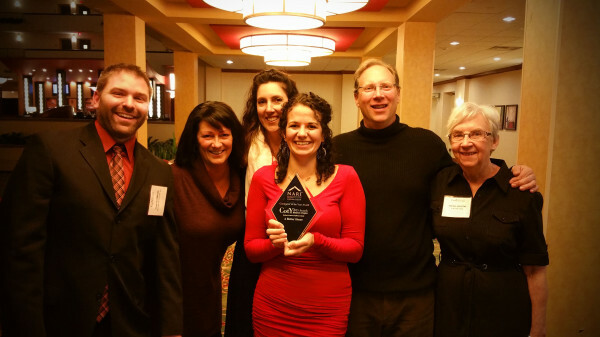 Who wouldn’t enjoy warm coats in these Wisconsin winters? 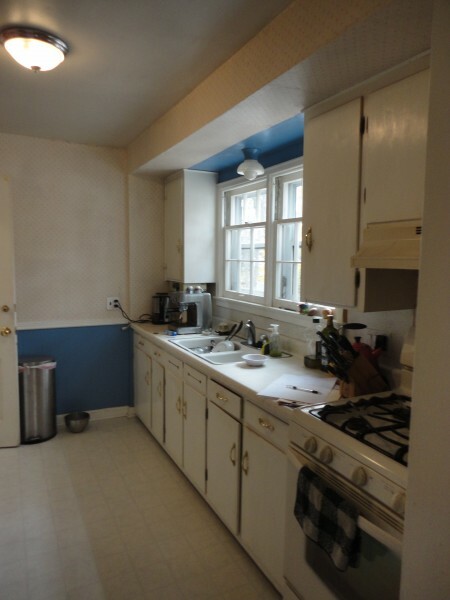 Now the radiator is away from the window where it was previously interrupting counter top space. 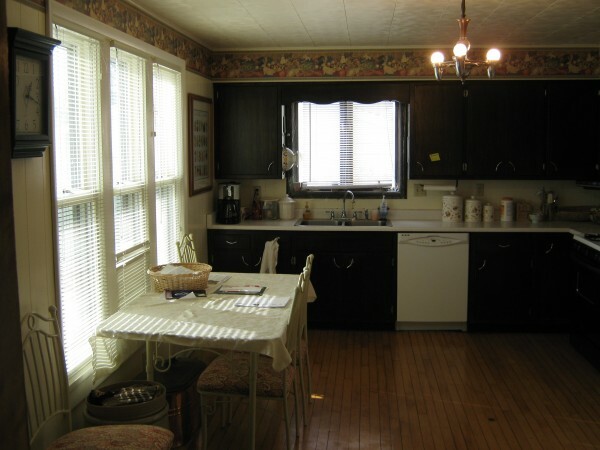 With all of the energy-saving products the home owners had installed, they earned a rebate through Energy Star for $750. 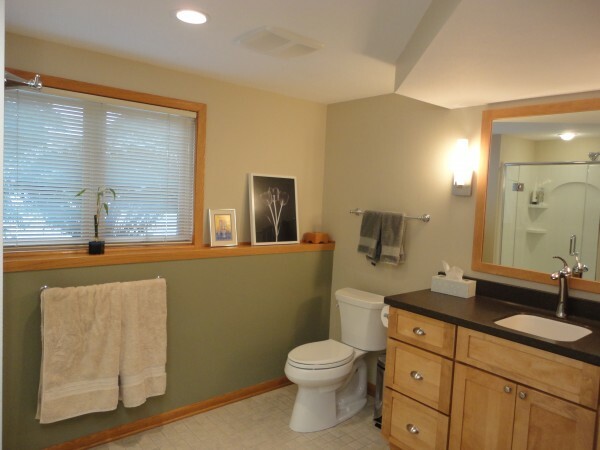 In addition to their craftsman kitchen remodel, the homeowners remodeled the small bathroom located behind the kitchen. 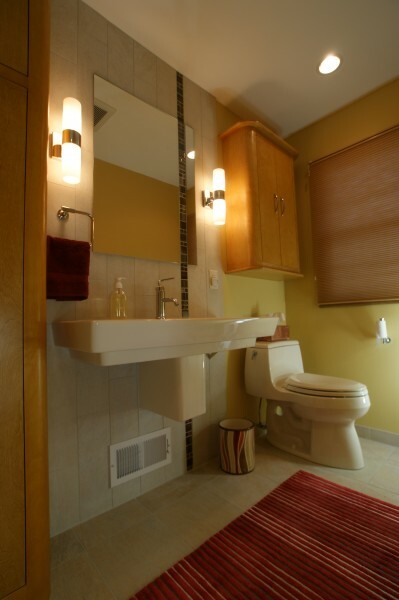 Check out our post Small Bathroom Turned Spacious to see how it turned out! 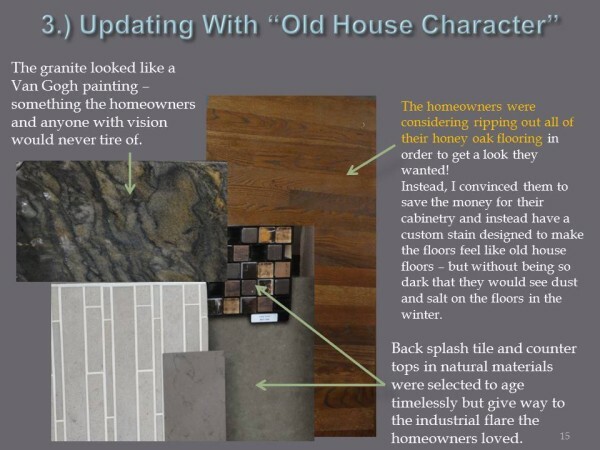 Since completion of their kitchen and bathroom remodel, the homeowners also tackled the 3-season porch on the front of their home. 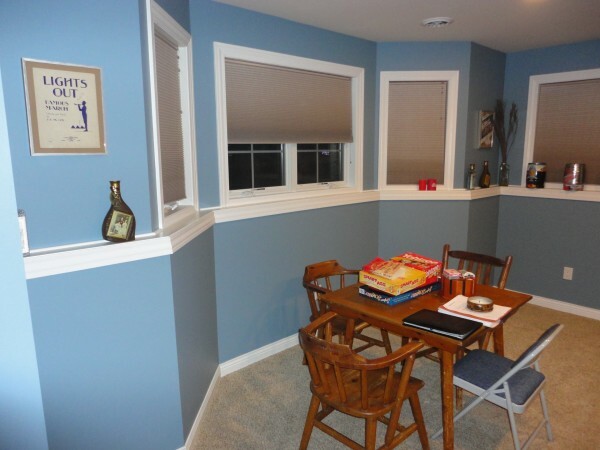 We completed the new sun room in April 2017. 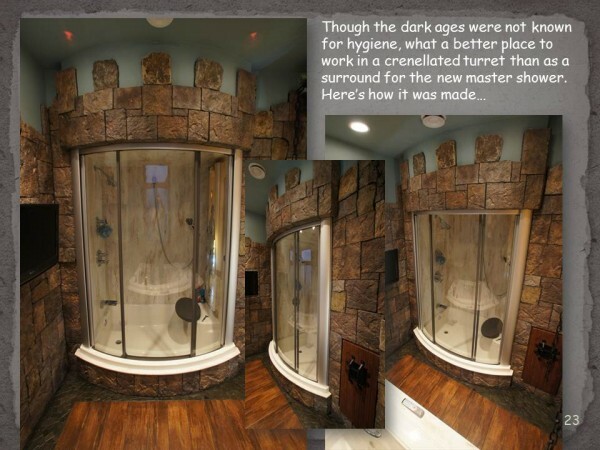 The result was a NARI CoTY Award winning space! 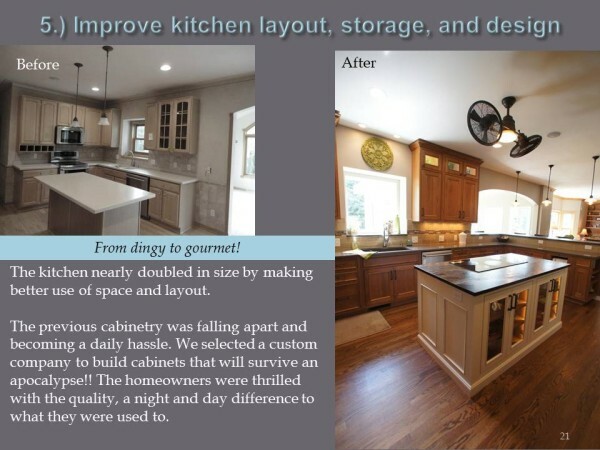 We also featured this beautiful home on the NARI Tour of Remodeled Homes in the spring of 2017. 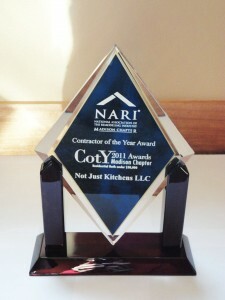 To read about their new sun room, check out our post Craftsman Sunroom- NARI Coty Award Winner. 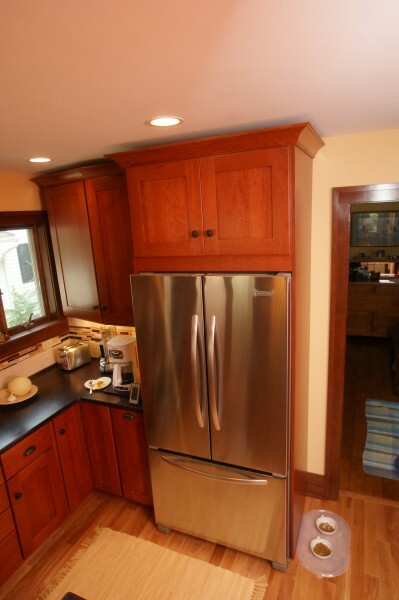 To see more project photos, visit our Craftsman Style Kitchens page. 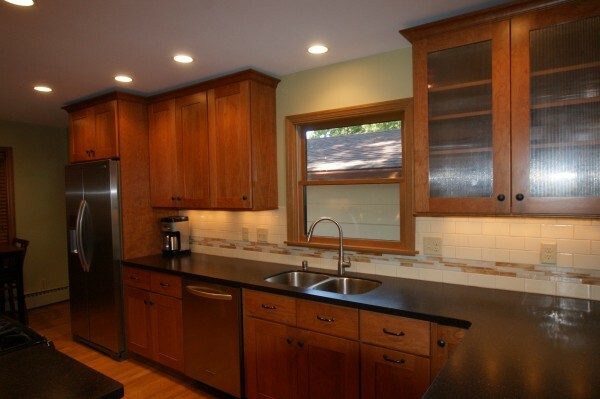 A 1950’s Inspired Kitchen Transformation in Madison, WI! 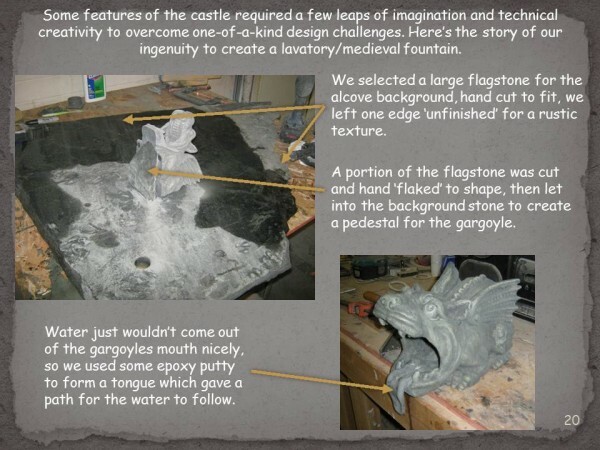 Attention to Detail – an old adage but oh so true for this project. 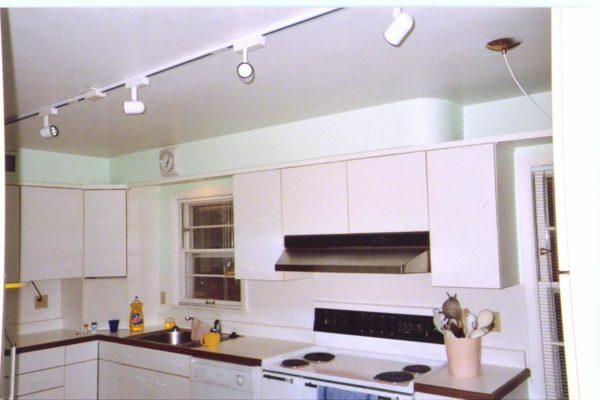 The all-white 1980’s kitchen was an eye sore to the homeowners who have an impeccable taste and love to cook and entertain. 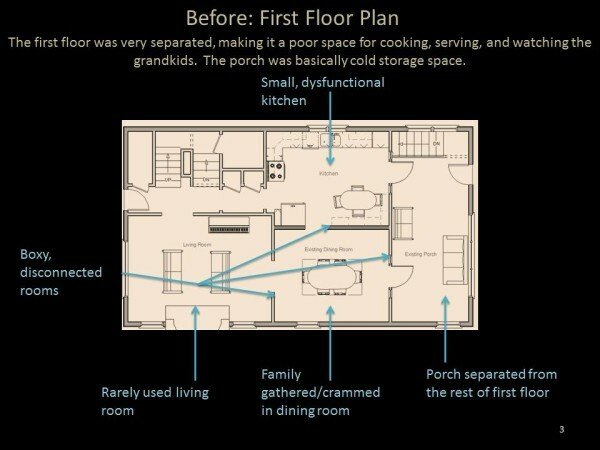 Besides being a 1980’s disaster of a design, the space was barely functional. 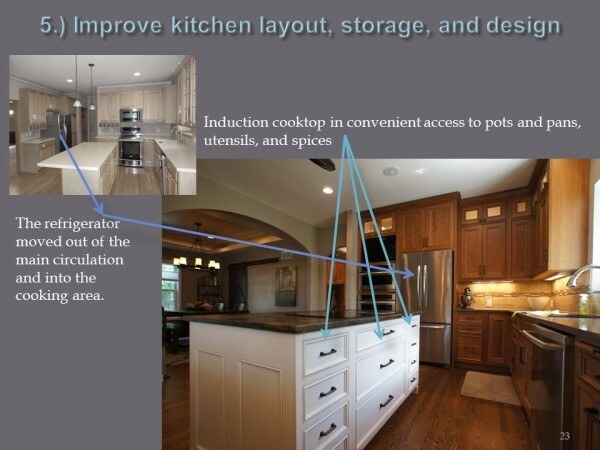 The new kitchen is 1950’s inspired, with its unique arrow inlays in the tile, drop-shaped light fixtures, and soft curvy lines. 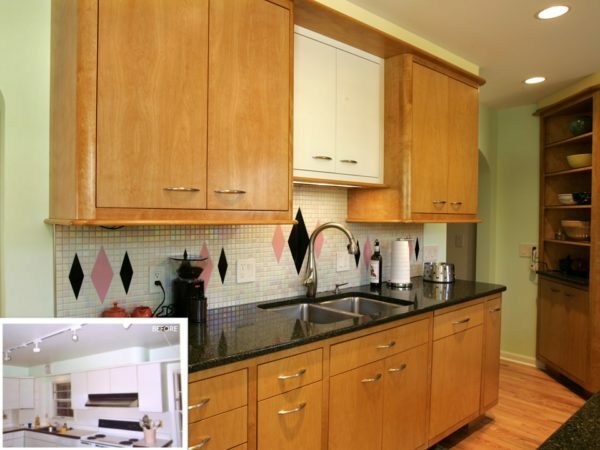 This kitchen transformation is one of our all-time favorites and has won numerous awards!